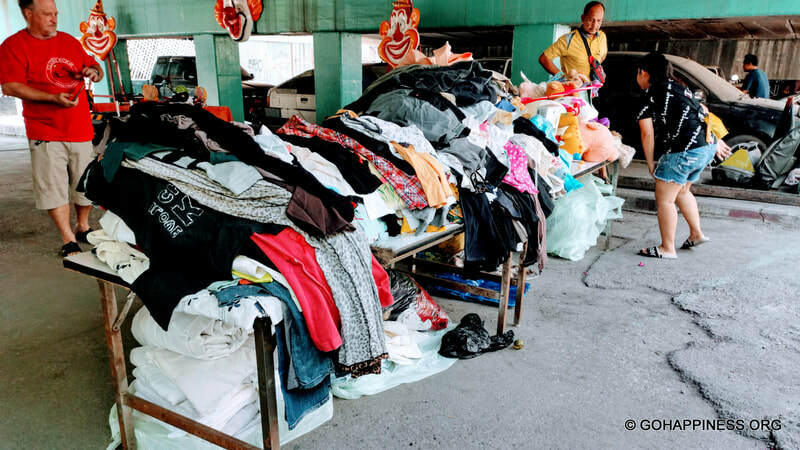 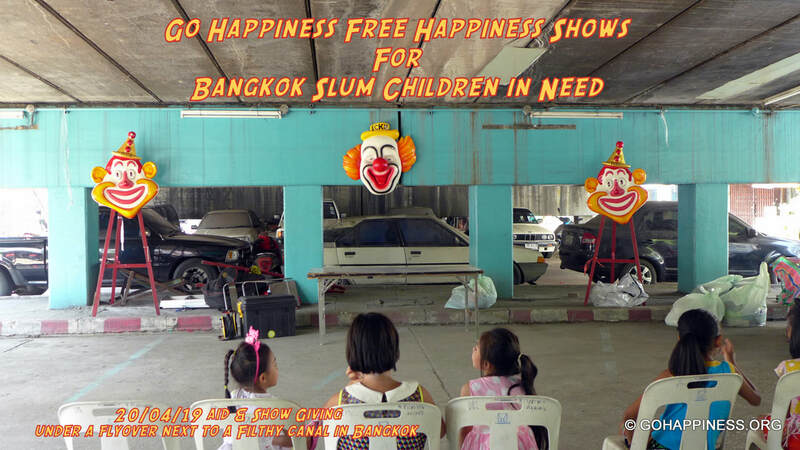 Bangkok Slum Dwellers Given Free Happiness Again! 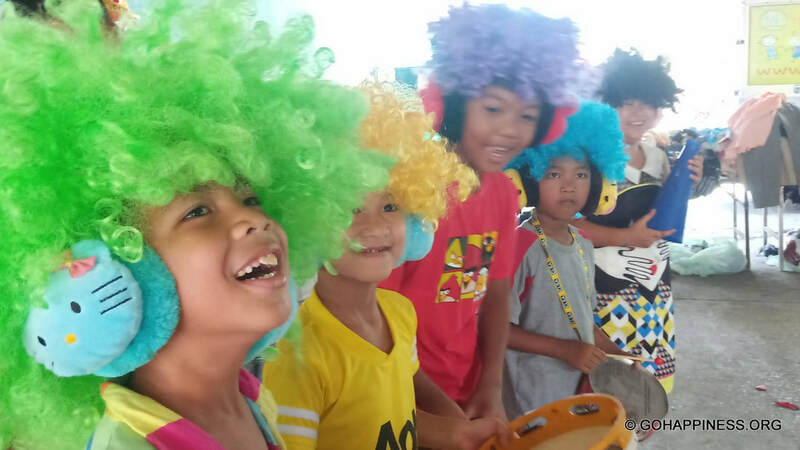 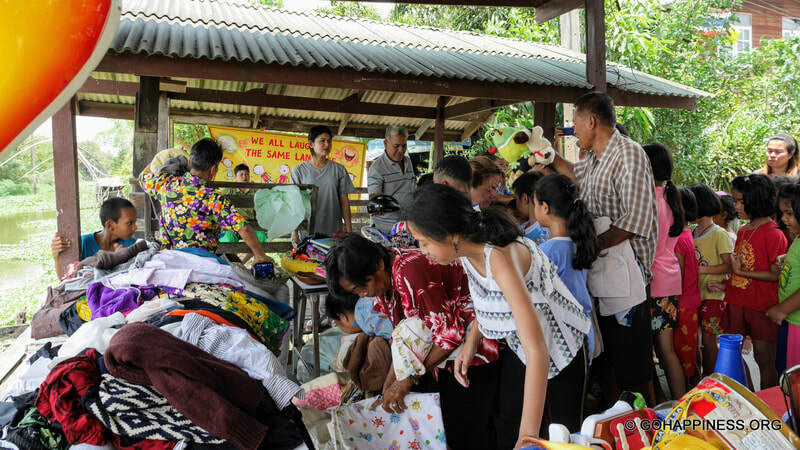 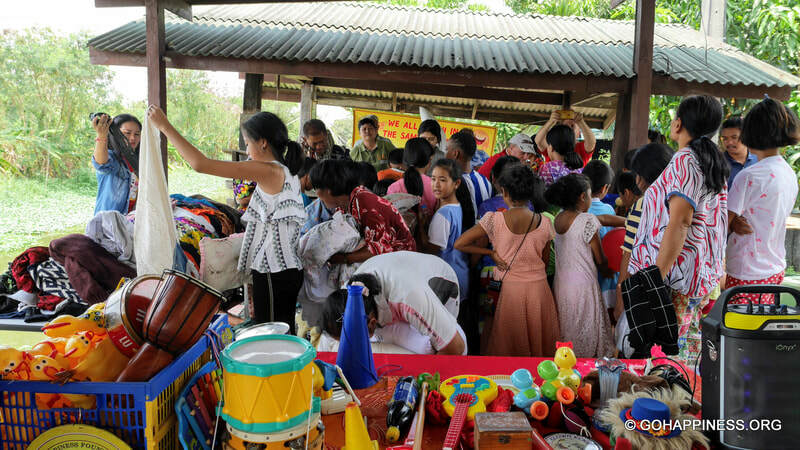 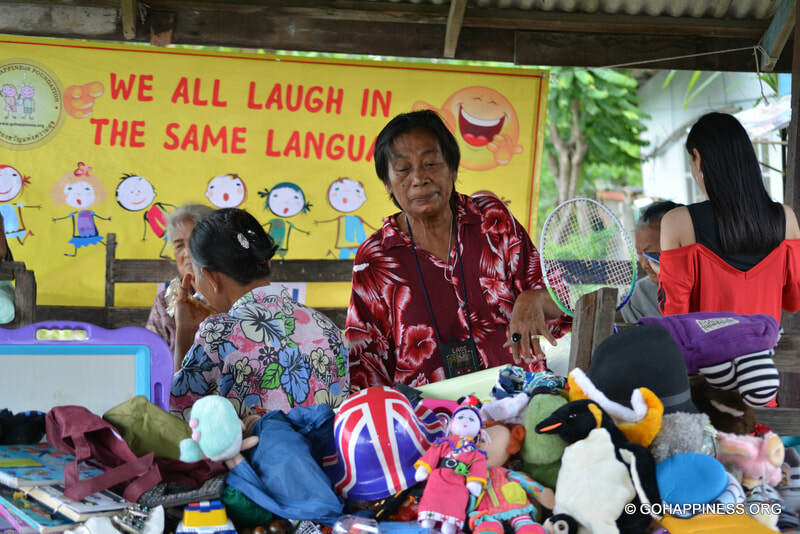 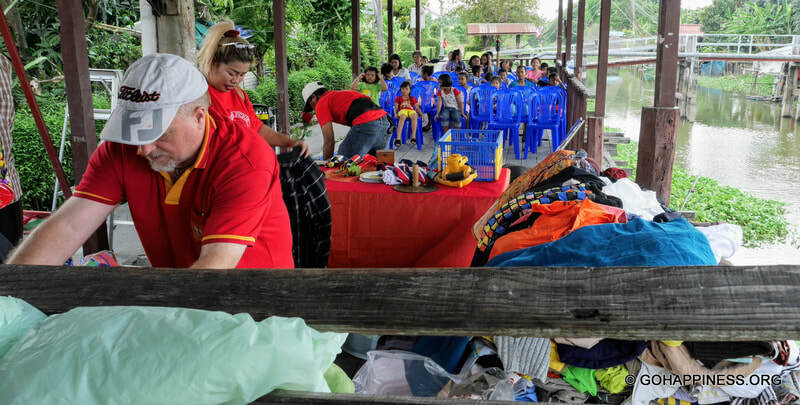 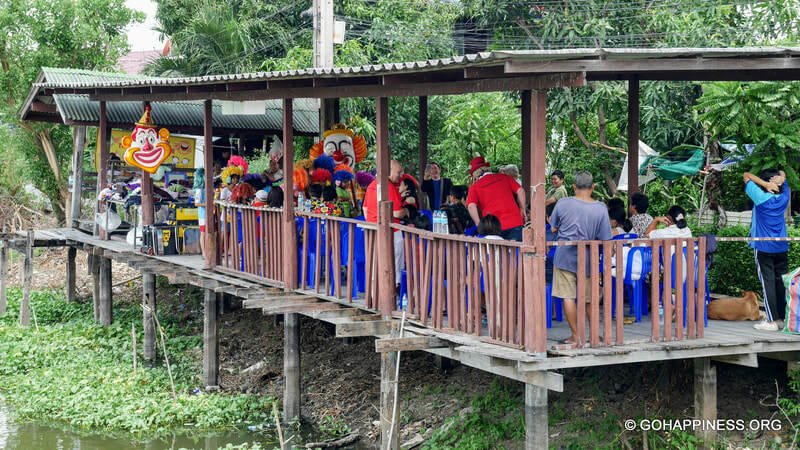 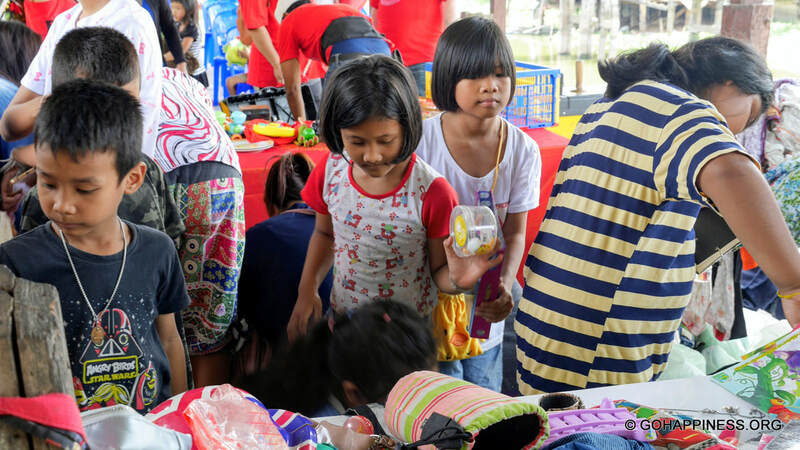 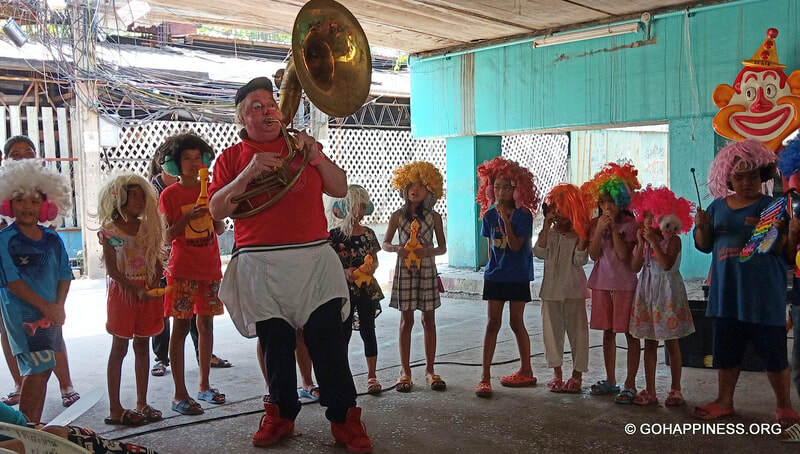 A few weeks ago the Gift of Happiness Foundation promised to give people living in slums alongside a Bangkok Canal called Khlong Tan, a free show and more essential goodies. 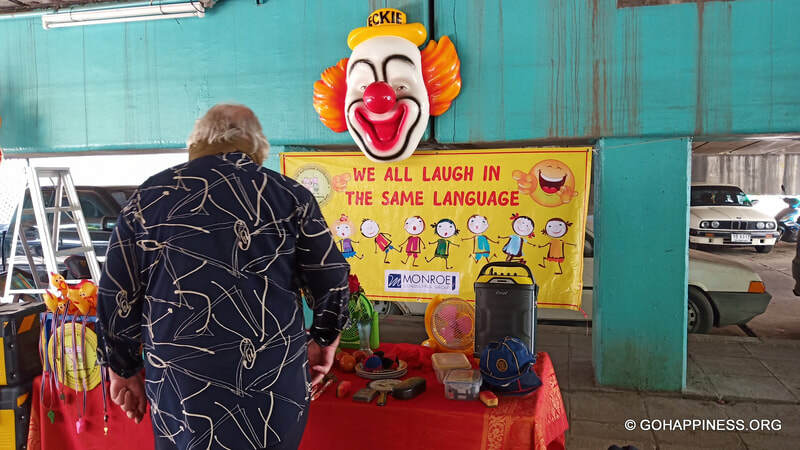 Well, it all happened on Saturday 20/04/19 when the Charity's Founder, Eddie Haworth (AKA Clown Eckie) gave a professionally arranged comedy performance designed to educate and enthral the children and parents alike. 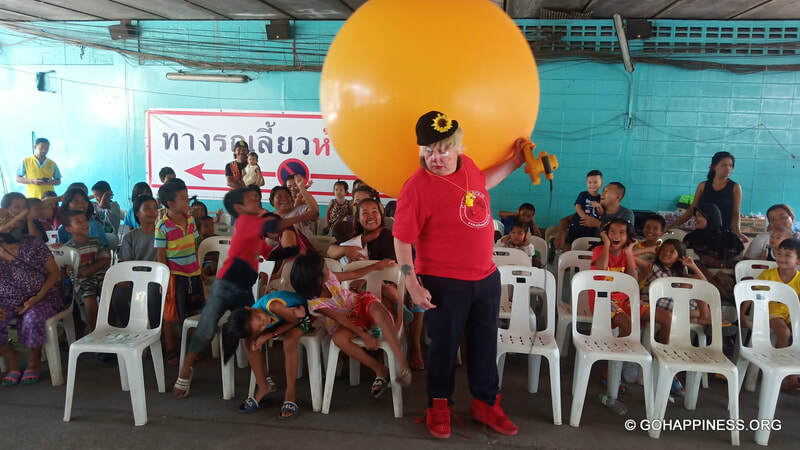 It was the first time any of the needy people living in this hidden community had ever seen such slapstick comedy presented by the only Professional Western Circus Clown in Thailand so, the exciting atmosphere created by the silly old clown was truly a sight to behold! 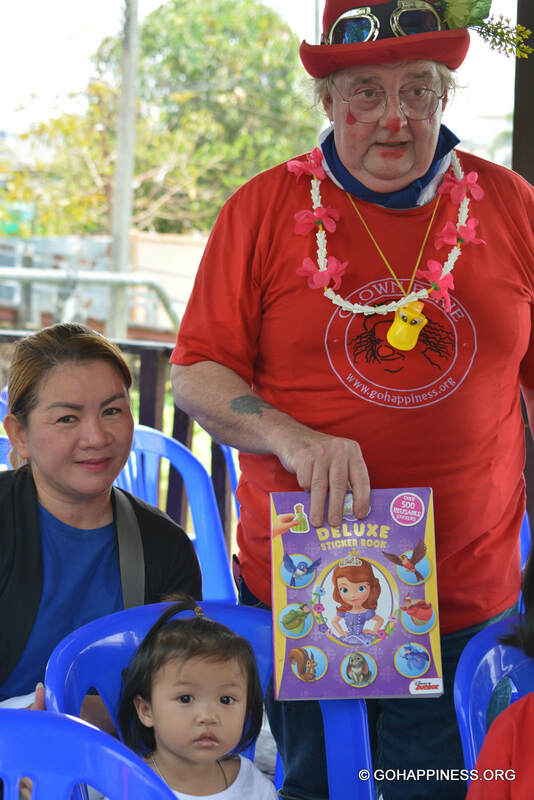 Volunteers attending the Gift of Happiness Foundation Aid and Performance Giving Project at Khlong Tan; Eddie Haworth, Nicol Burr, Tony Doherty, Max Peters, Miss Kate Somkhuntod, Dougie Brown. 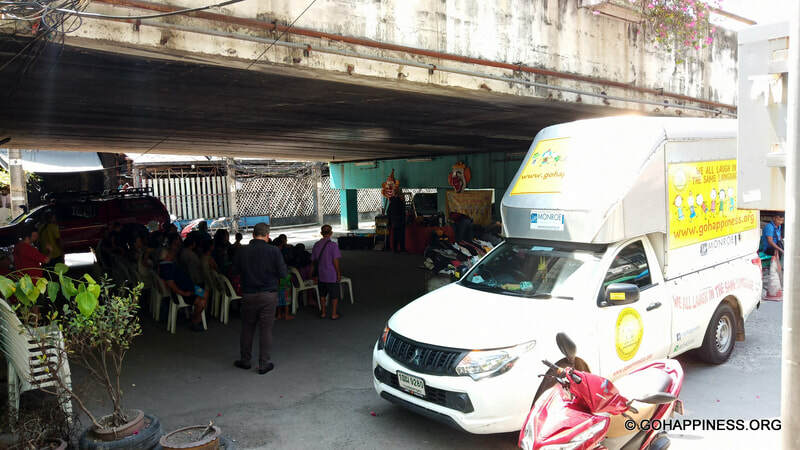 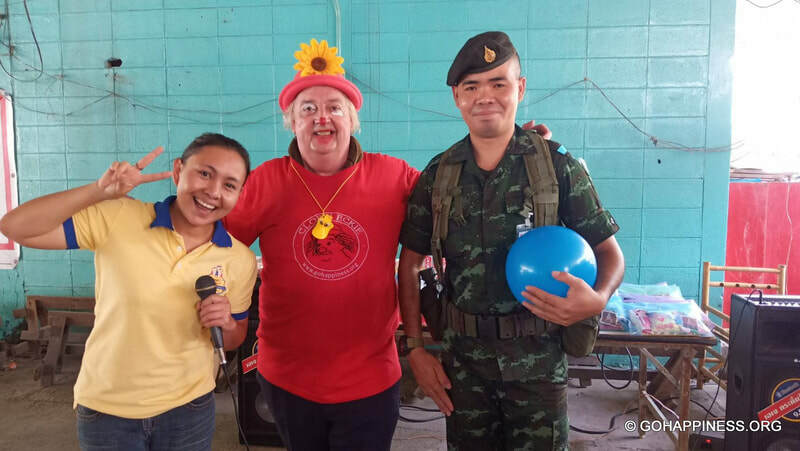 Attended by Soldiers from The Royal Thai Army, teaching Slum Dwellers about the dangers of taking drugs. 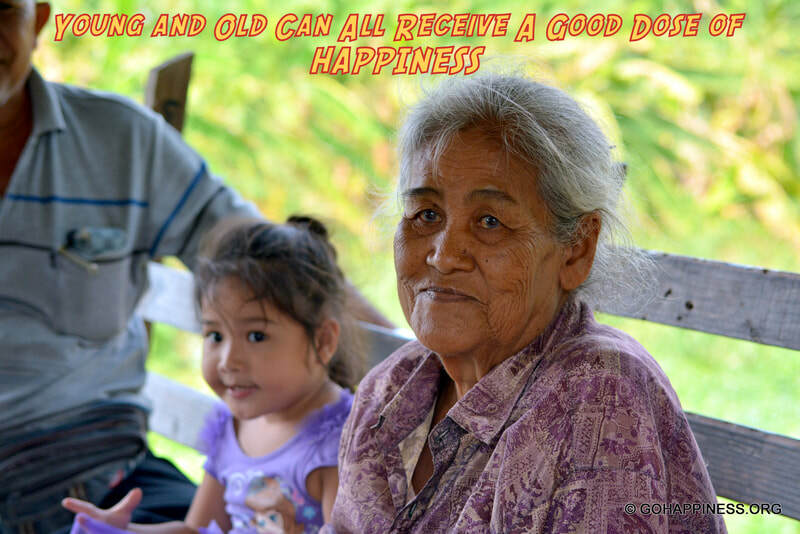 The beautiful thing about giving happiness is that nobody can take it away from those who receive it". 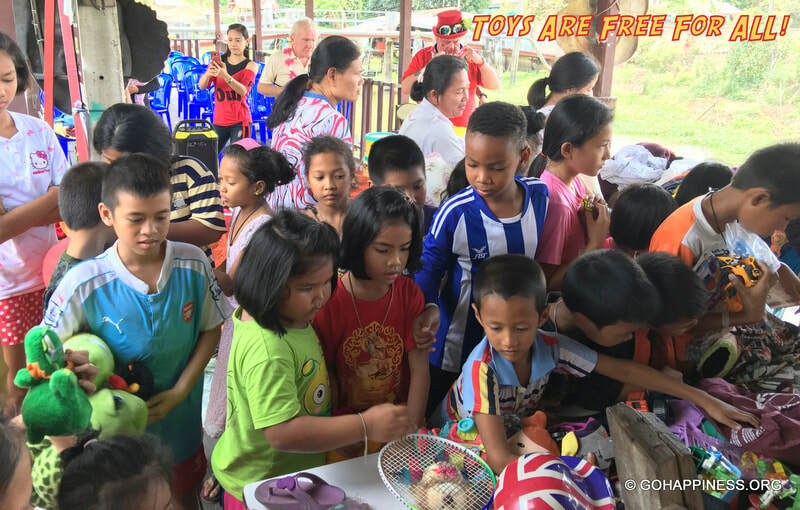 I believe the body heals with play, so I unconditionally give them toys. The mind heals with laughter, so I give them happy memories that no-one can ever steal from them. 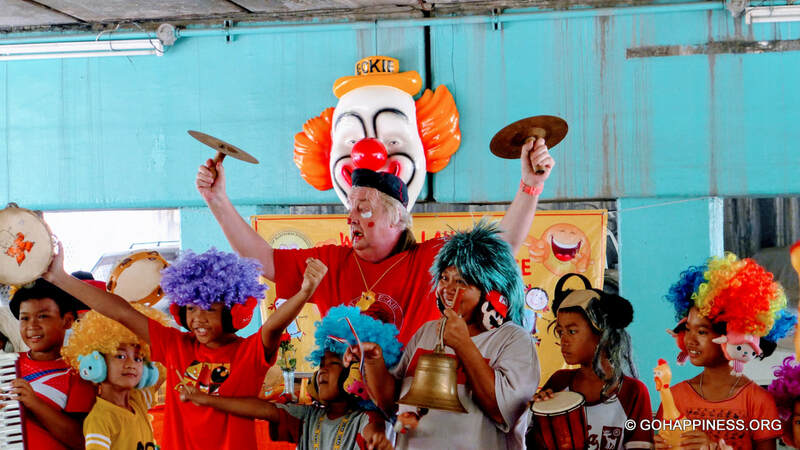 And the spirit heals with inspirational positive thought, so I insist on giving them the self-confidence to engage in child-centred, simple comedy acting! 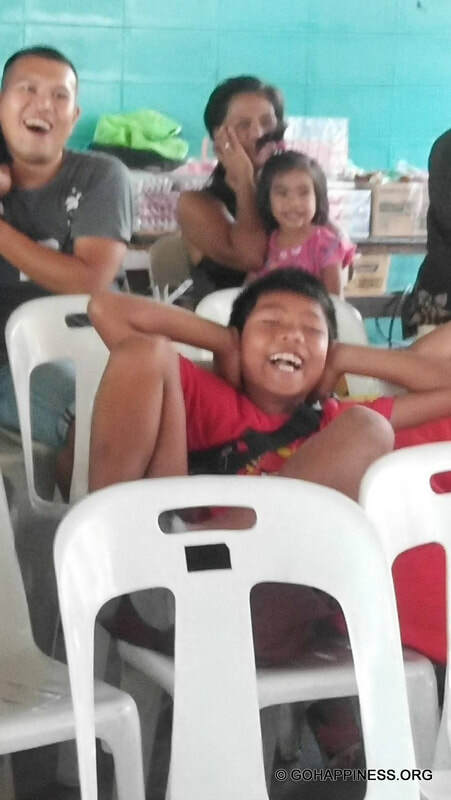 Positive experiences like having a good old-fashioned laugh helps children living in difficult circumstances to cope and gives them a positive memory that will always belong to them. 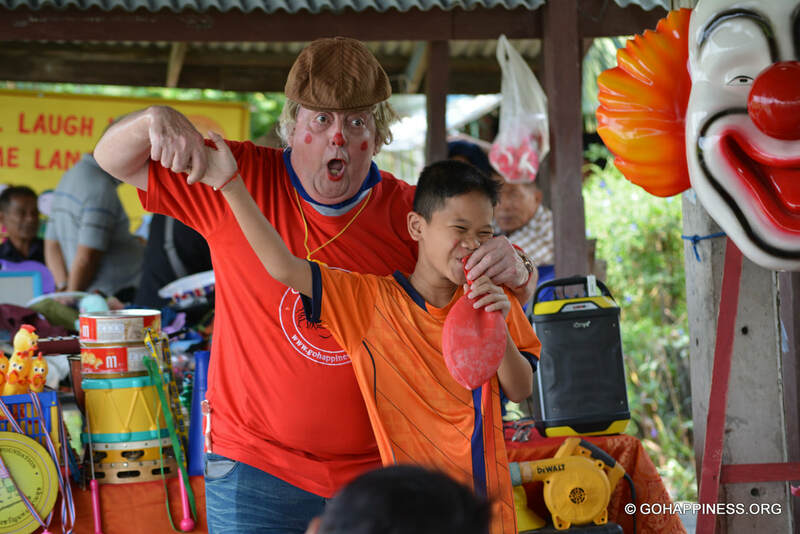 Seeing and interacting in educational comedy helps children to use their senses and minds to explore then make sense of what they see, feel and experience in the world around them. 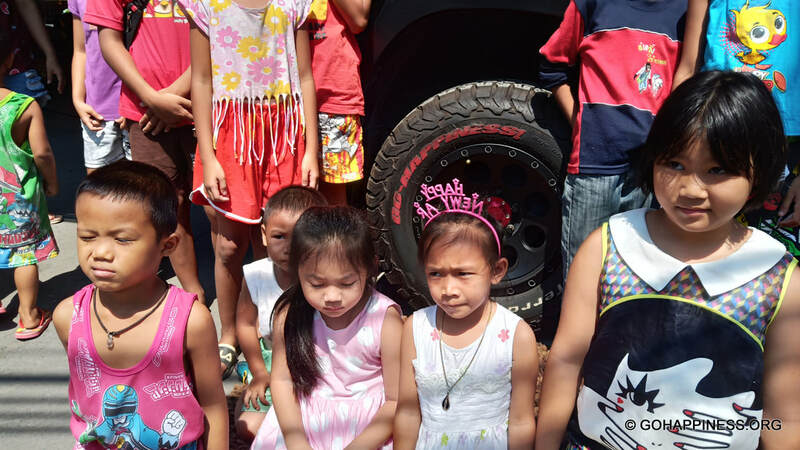 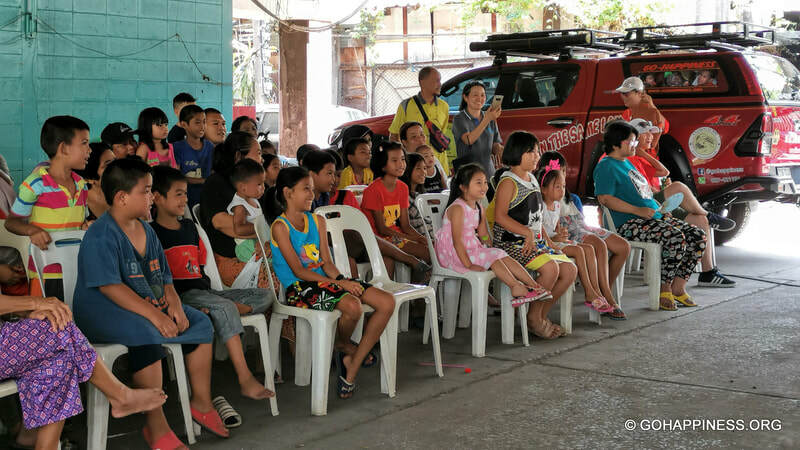 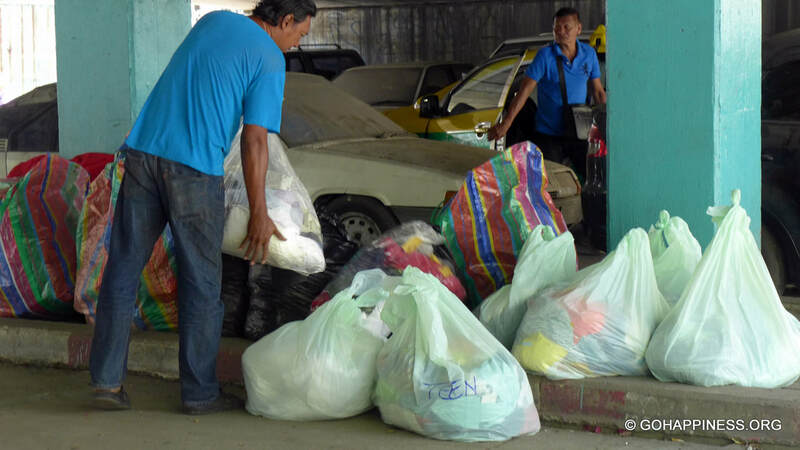 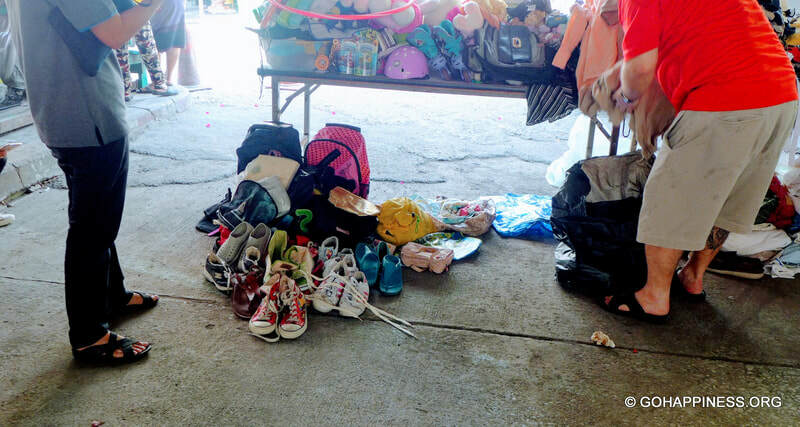 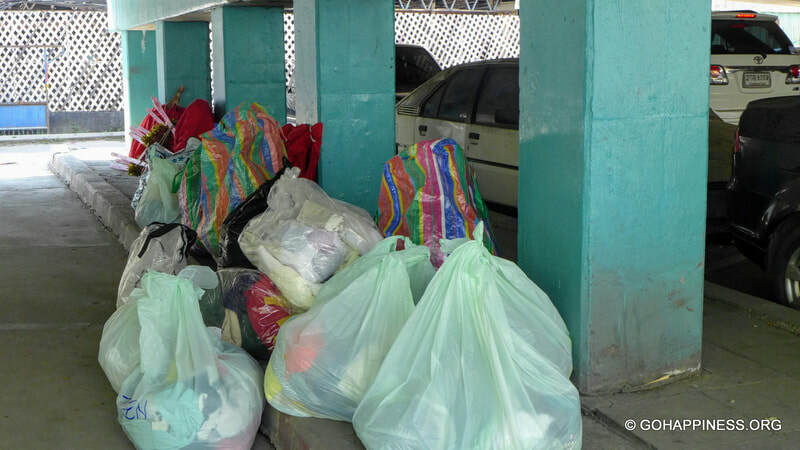 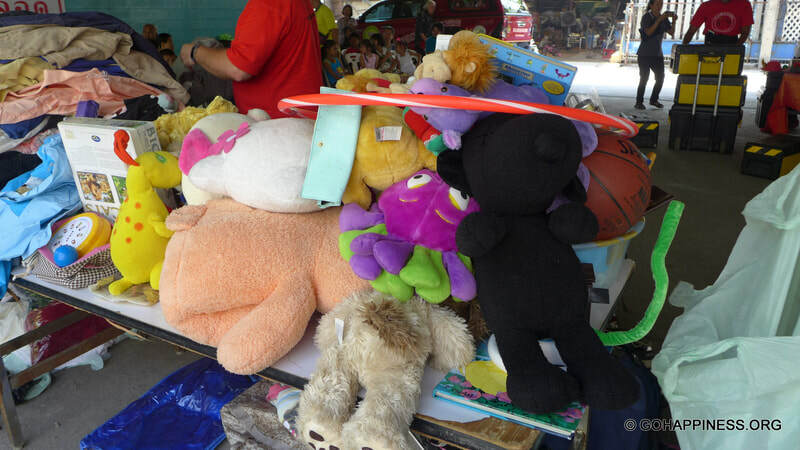 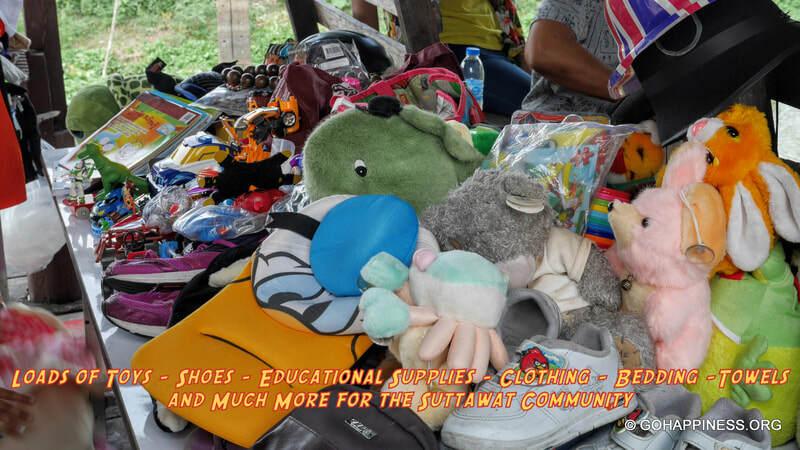 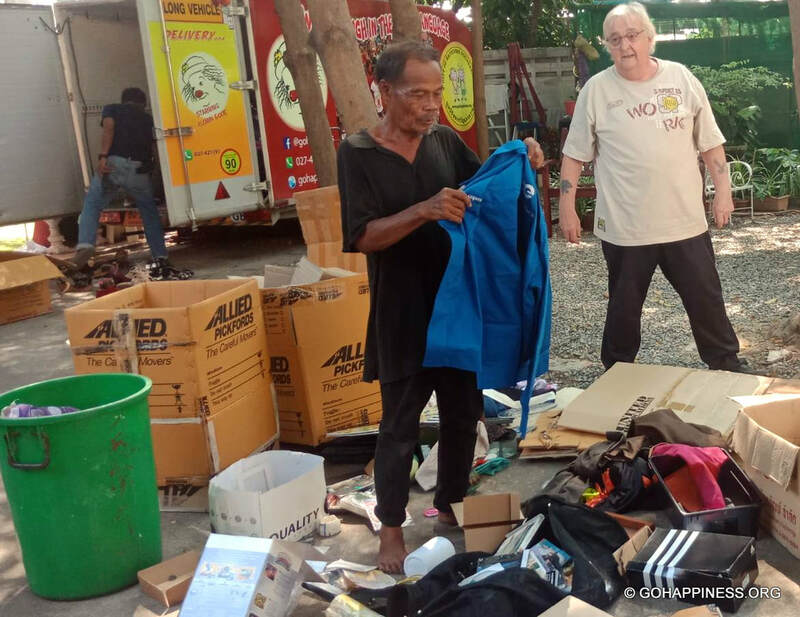 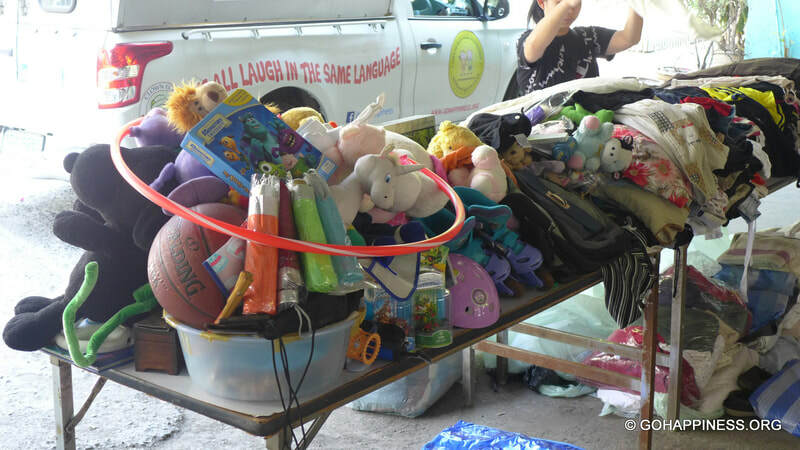 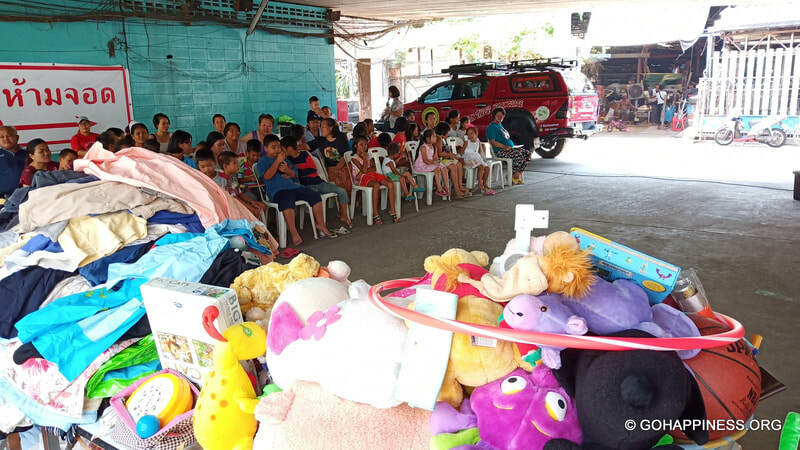 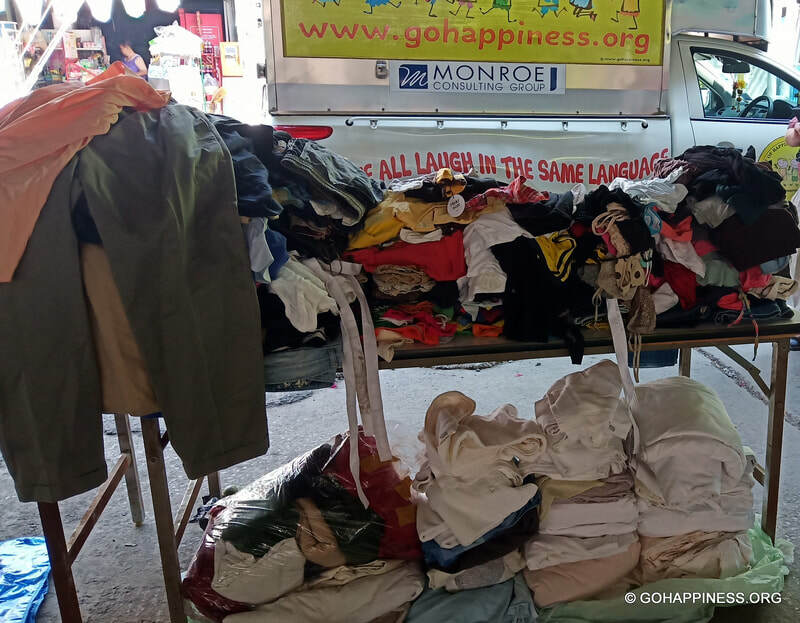 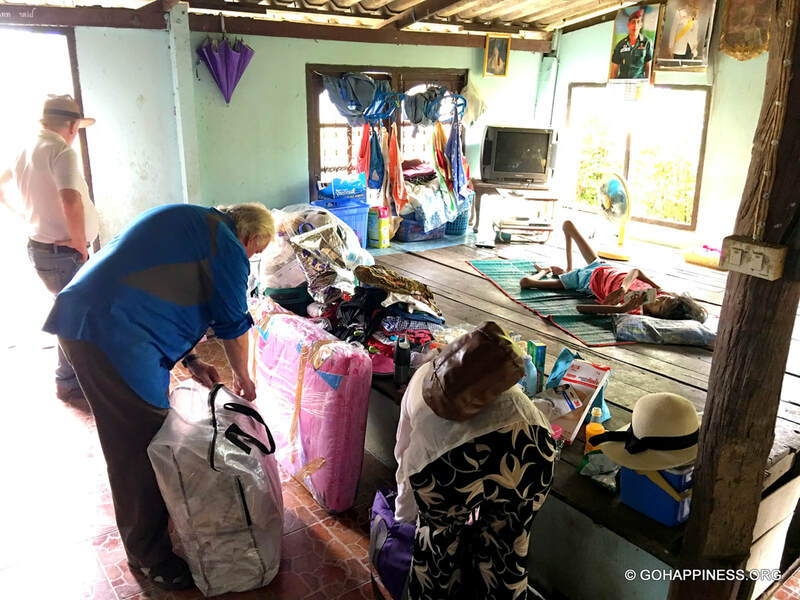 ​Read more of Eddie's thoughts on happiness..
During this visit the charity gave another truckload of of brand-new underwear, used and new clothing, bedding, toweling and toys for all the children. 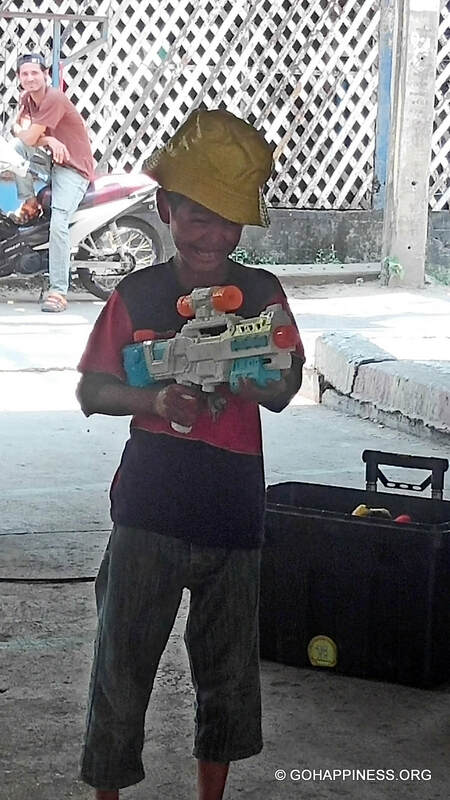 Such simple things can bring so much joy into the lives of children who live under such harsh circumstances. 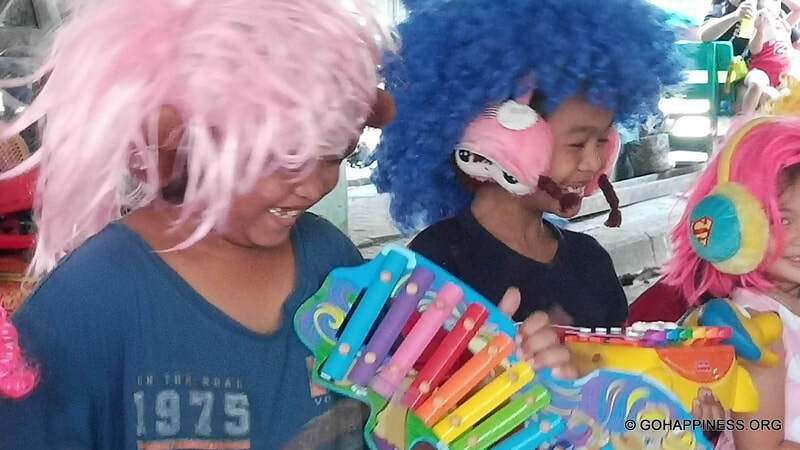 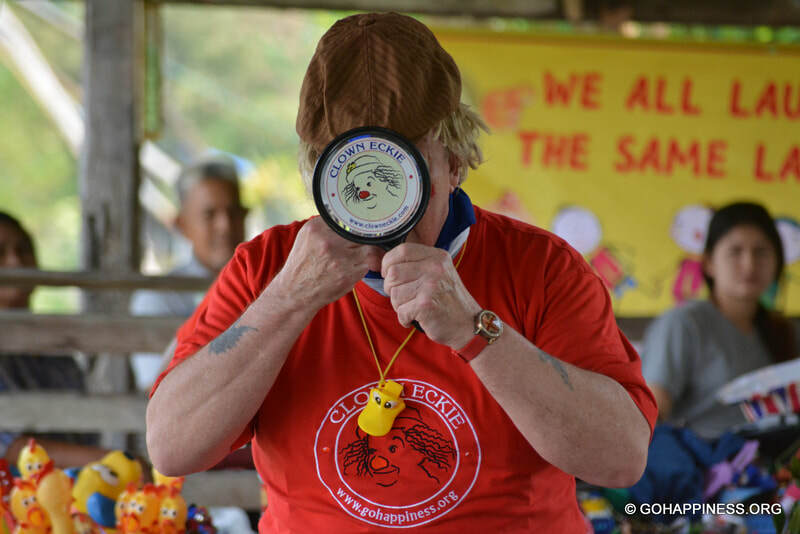 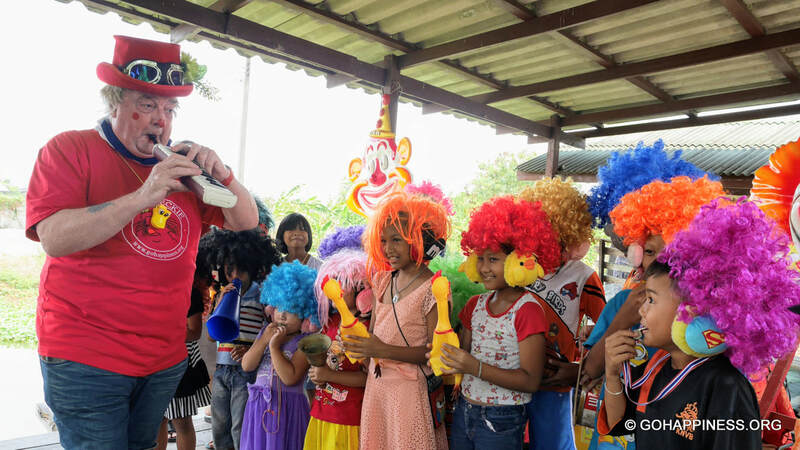 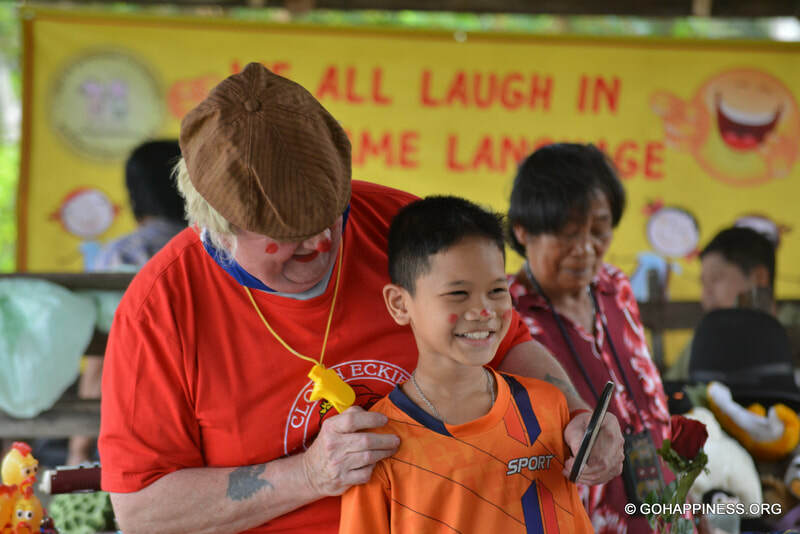 We were rewarded with genuine appreciation for the life enhancing performance by Clown Eckie and all the fantastic gifts to help sustain the residents of Khlong Ton Community for many months, if not years to come! 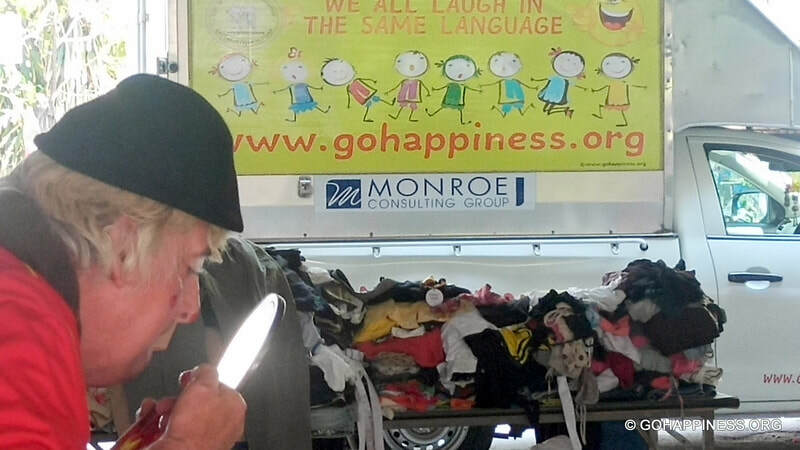 Go Happiness is running low on stocks of brand-new underwear for children in need! 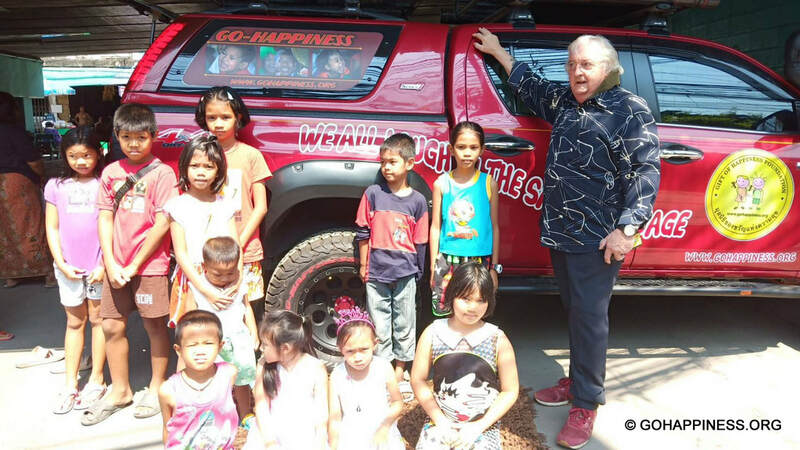 100% pledge; Donations go directly to fund our projects Gift of Happiness Foundation pledges to ensure that 100% of public and corporate donations will go directly to fund our projects. 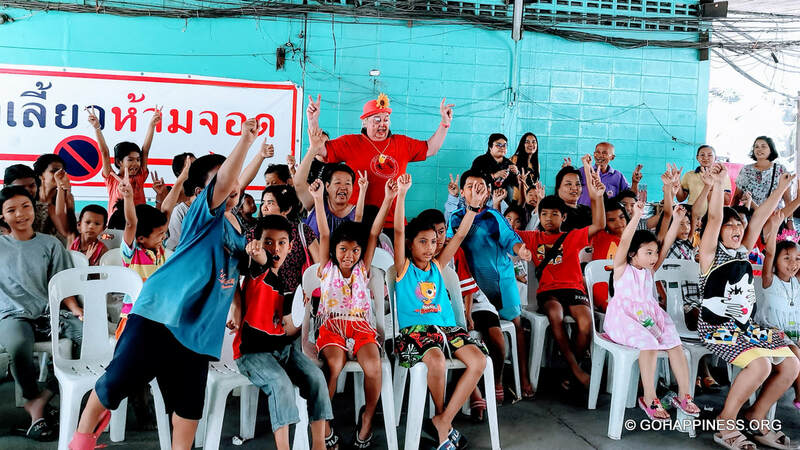 We provide vital aid and edutainment giving projects serving an average 2,000 children in need every month, plus many more families who are living in the slums of Bangkok. 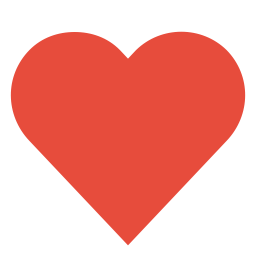 We cannot achieve this alone. 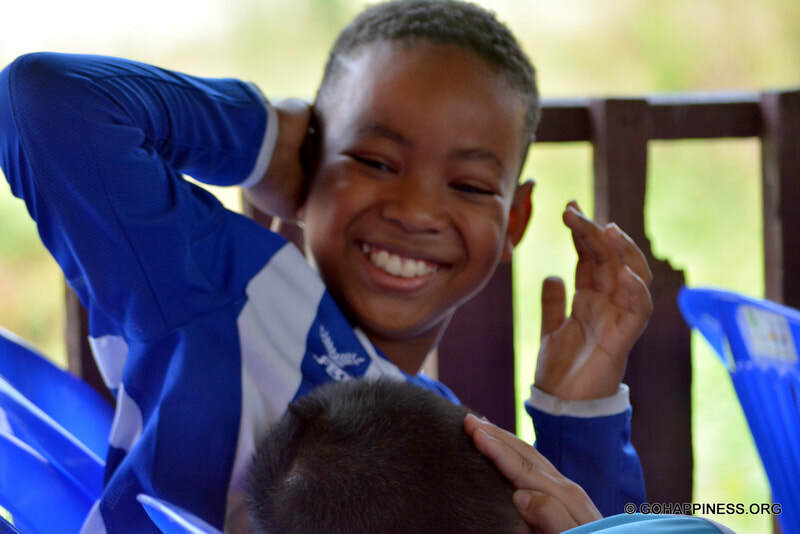 The support of our donors, campaigners and friends is vital, so we want to make sure that we operate an efficient and effective organisation, directing our donor’s money where it is most needed. 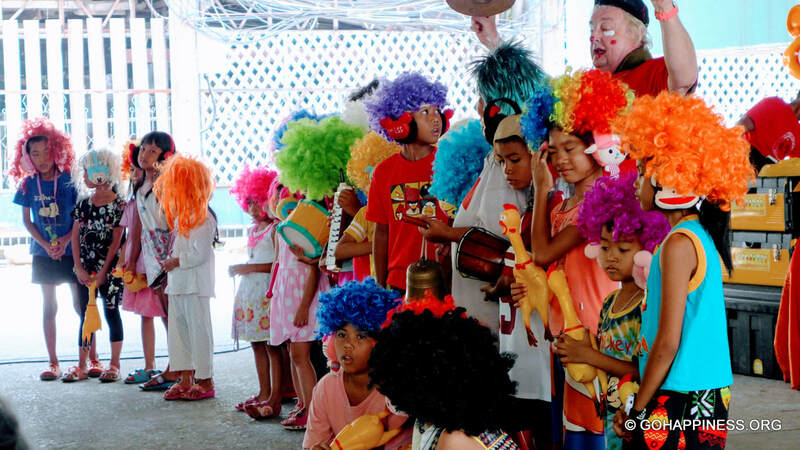 This is where our 100% pledge comes in. 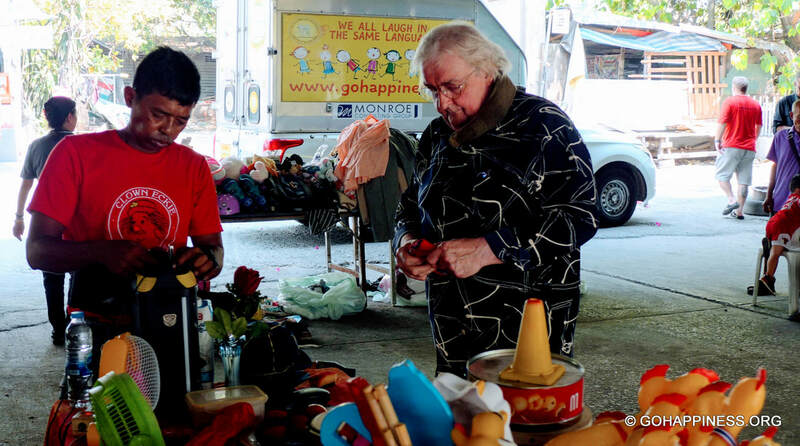 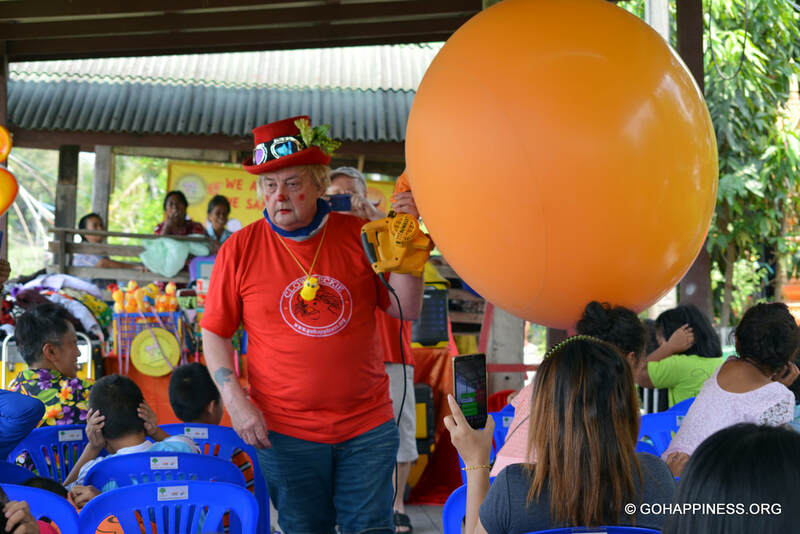 In 2005, our Founder, Mr Eddie Haworth (AKA Clown Eckie Corporation) provided more than 500,000-THB ($15,964-USD) as required in legal fees and Government registration fees to set-up the Thai registered charity, Gift of Happiness Foundation. 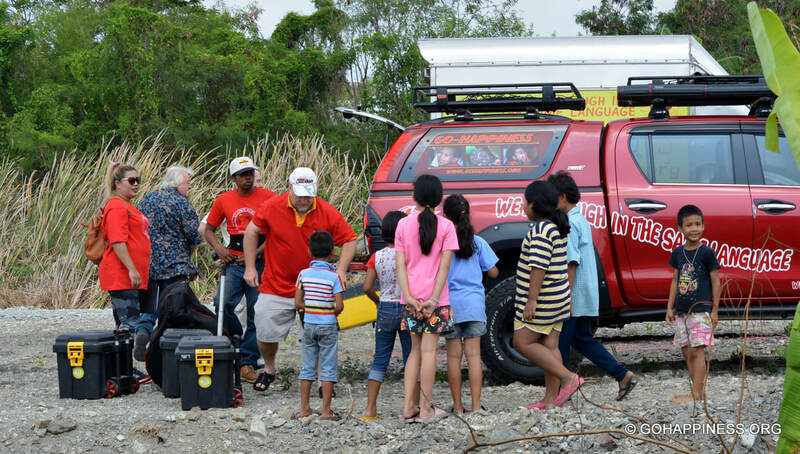 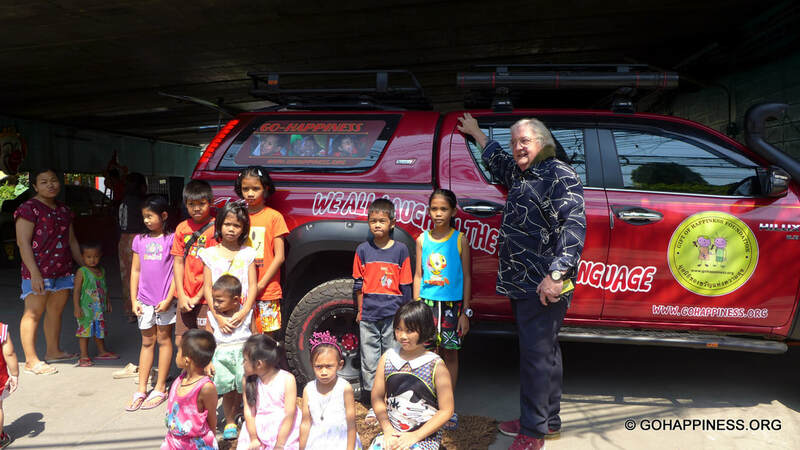 Eddie also provided the main 4x4 off-road capable vehicle needed for the charity to bring essential goods to remote parts of Thailand. 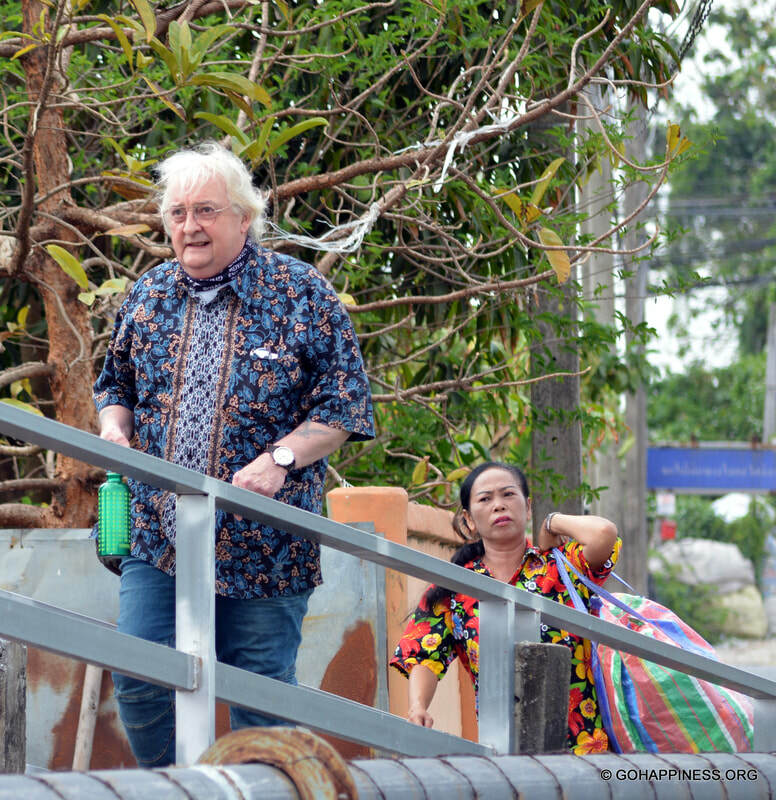 He still covers repayments and maintenance costs for the latest 4x4 vehicle, purchased in 2018 at a cost of ฿1.2 million-THB ($38,300-USD). 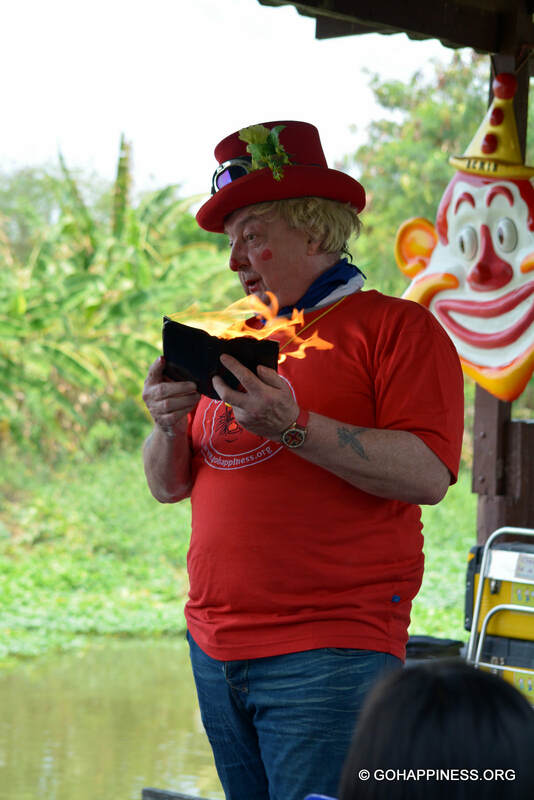 Eddie continued to cover all other running costs until Monroe Consulting Group, Bangkok made a 100% pledged to take-over those costs in 2015. In 2015, our inspirational gold sponsor, Monroe Consulting Group gave Gift of Happiness Foundation the gift of a brand-new truck and a pledge to provide monthly cash donations to cover the Gift of Happiness Foundation’s core running costs; including administration, fundraising and office costs. 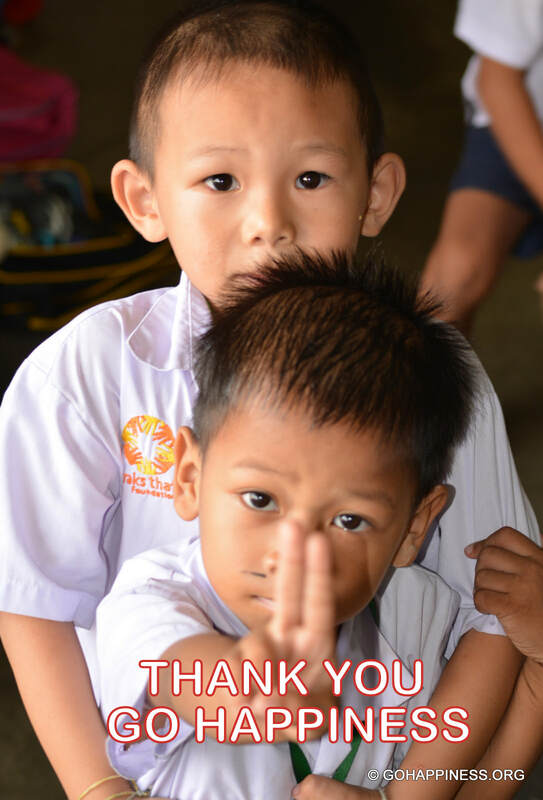 Thanks to the generous support of Monroe Consulting Group, 100% of the money you give to Gift of Happiness Foundation will go directly to Gift of Happiness Foundation projects and not to overhead or administrative costs. 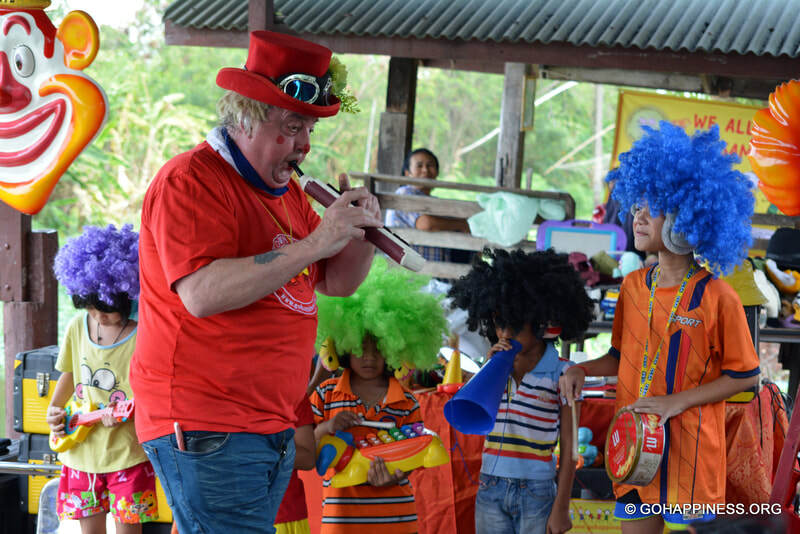 100% pledge; The following core running costs are covered by Monroe Consulting Group and the Clown Eckie Corporation; Fundraising and administration costs - Governance costs - Rent, service charges and utilities such as electricity, postage and carriage - insurance - Telephone and fax - Office stationery services and expenses - IT services - Bank charges - Recruitment - Audit, payroll and accountancy fees. 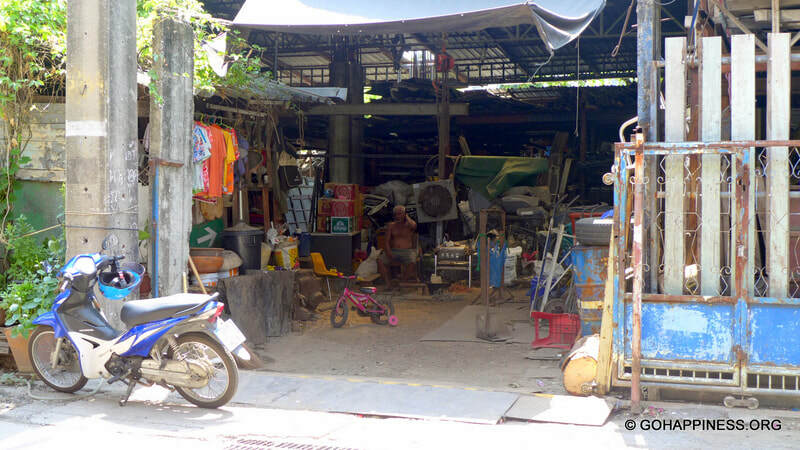 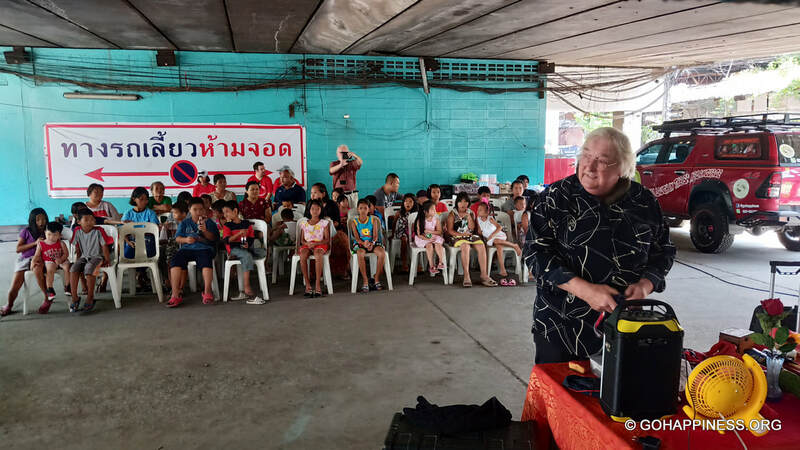 More Lives Improved at Sutthawat near Bangkok! 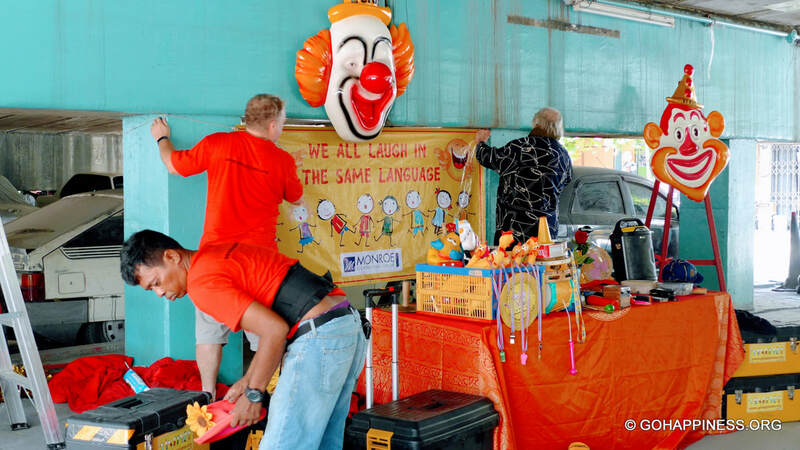 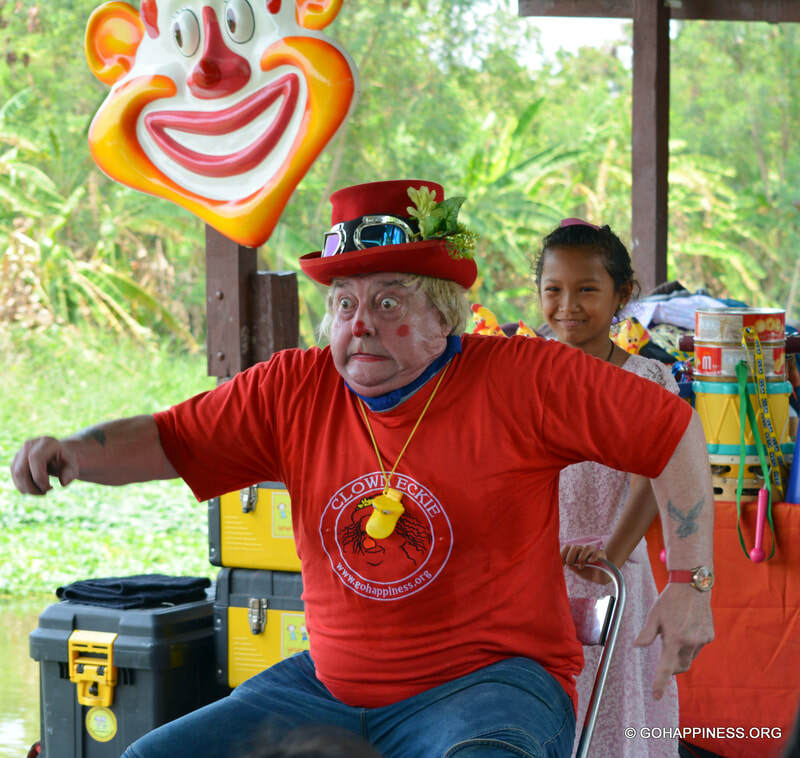 ​a truck full of essentials and a "Big Fat Buffoonery Show" by Clown Eckie! 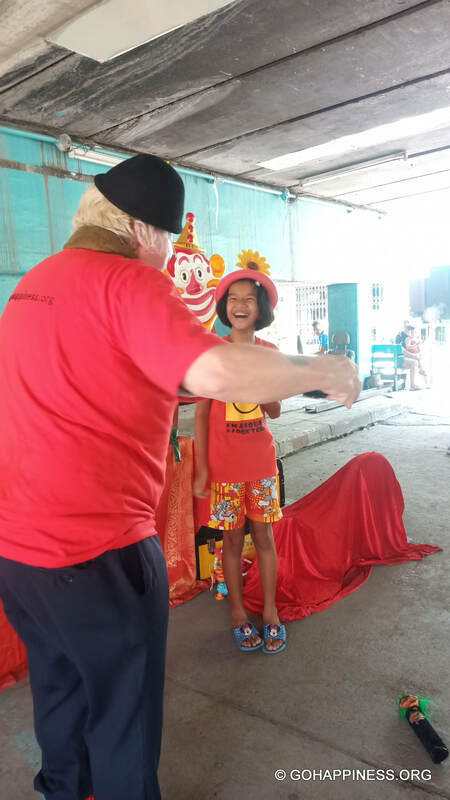 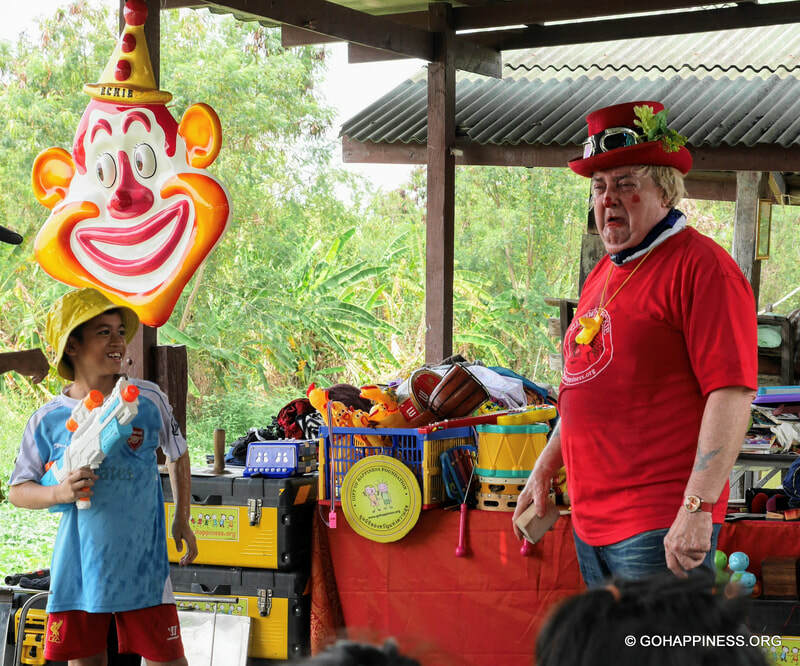 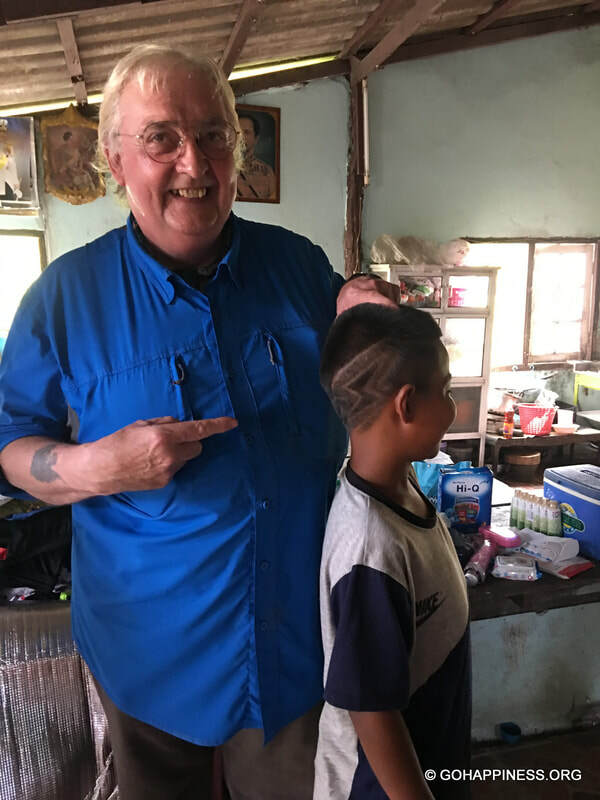 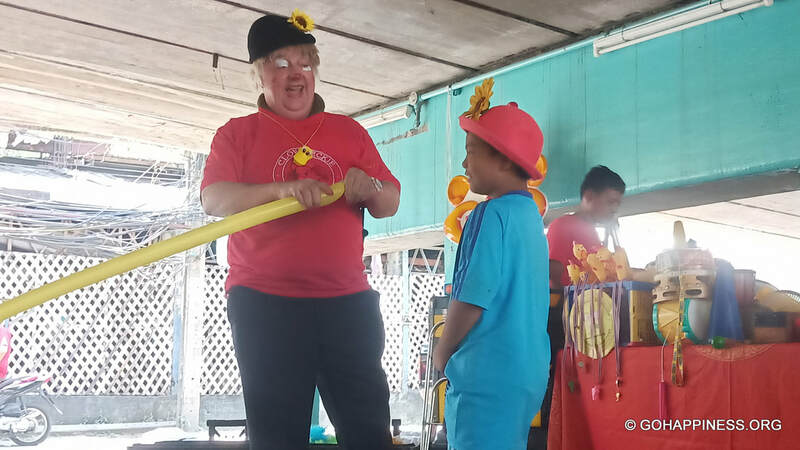 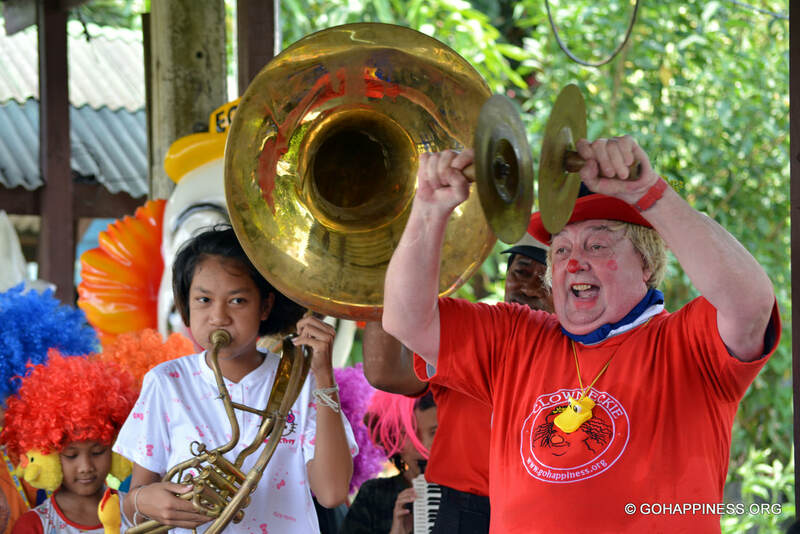 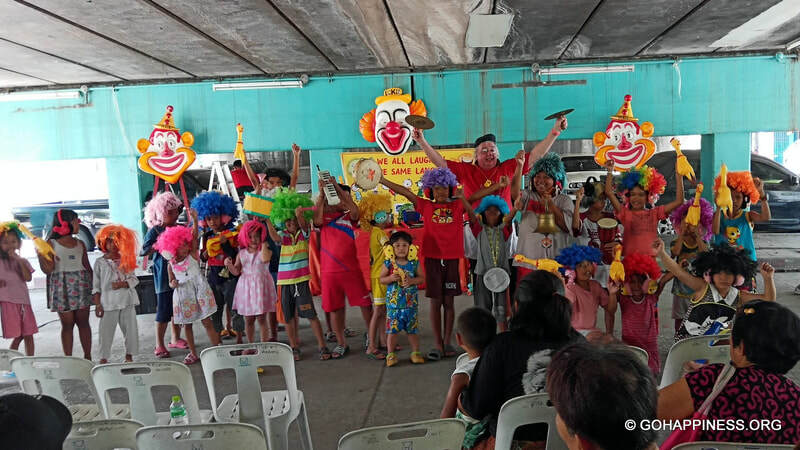 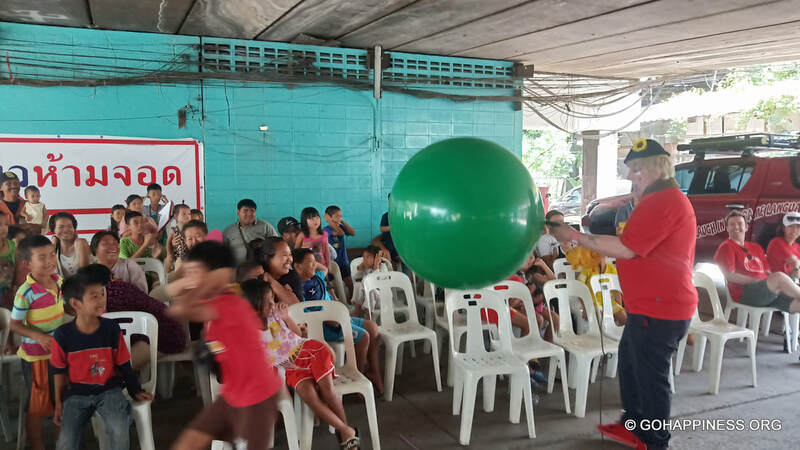 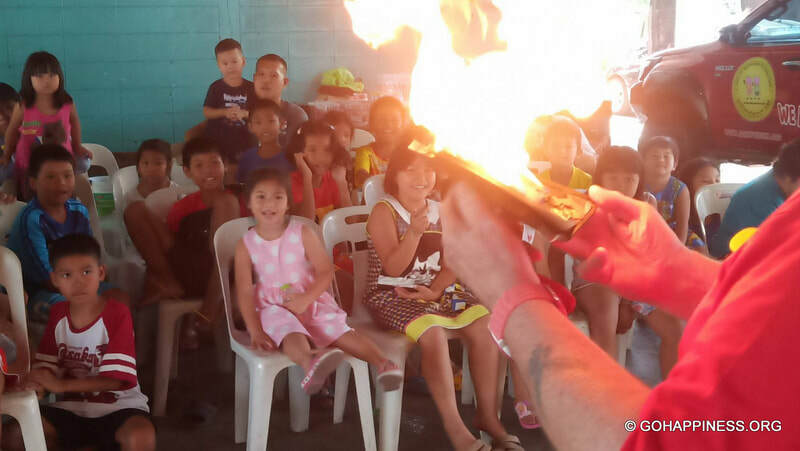 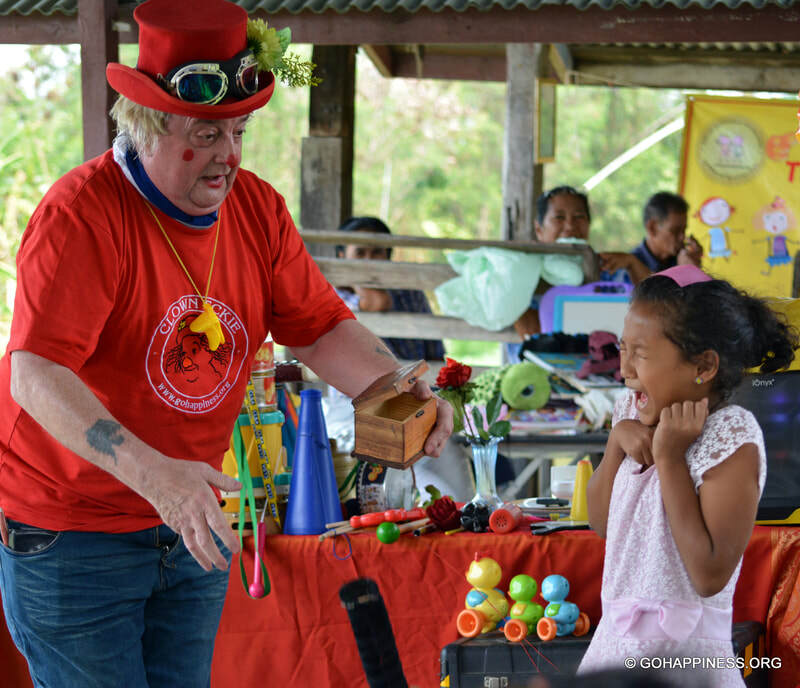 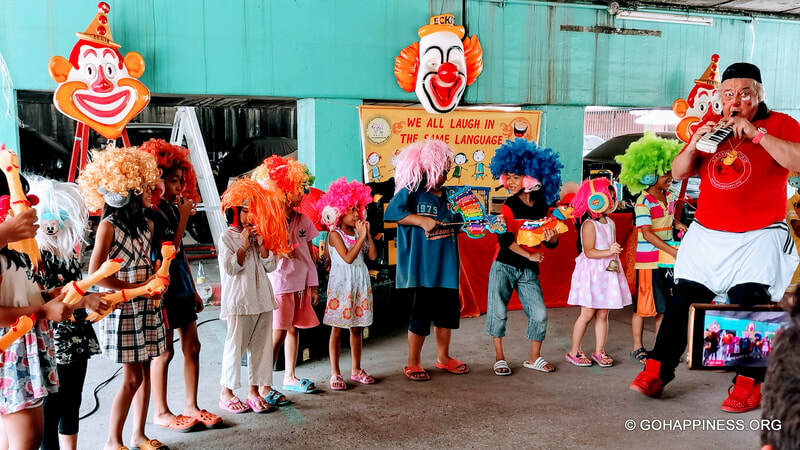 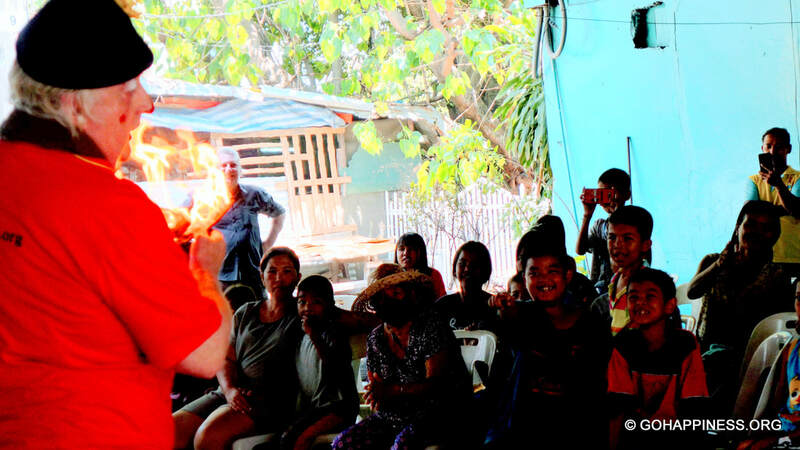 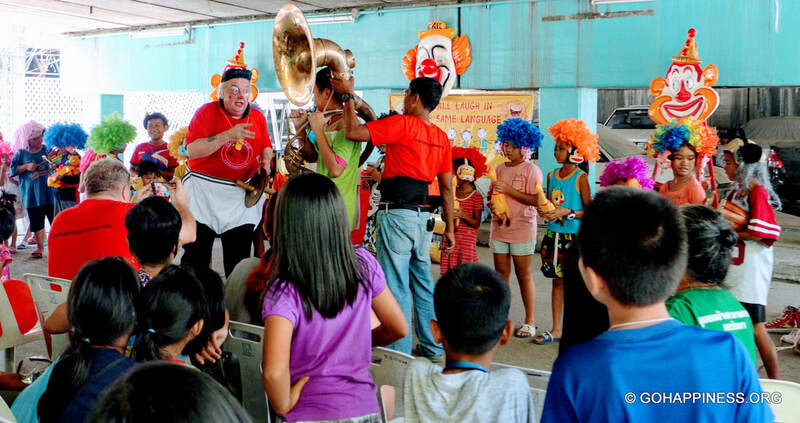 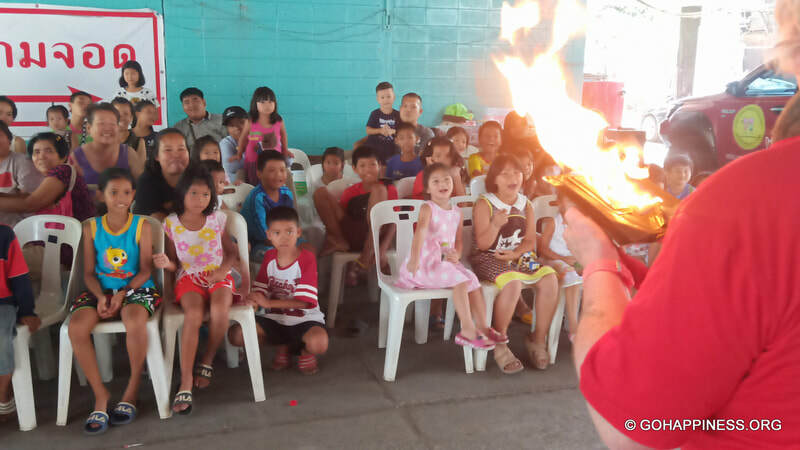 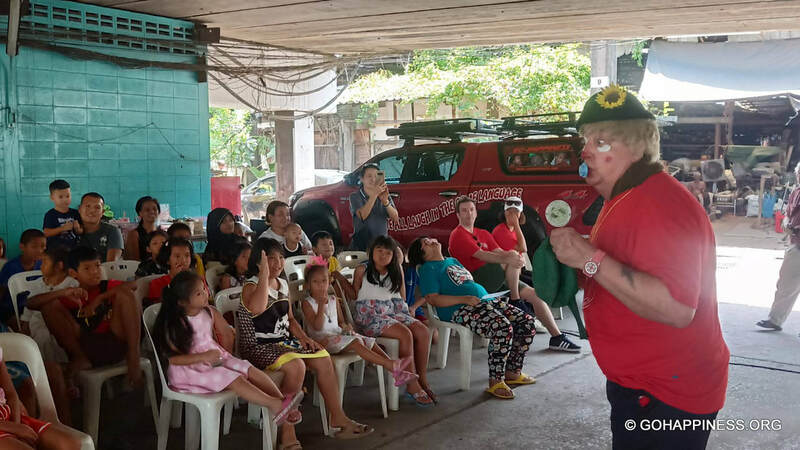 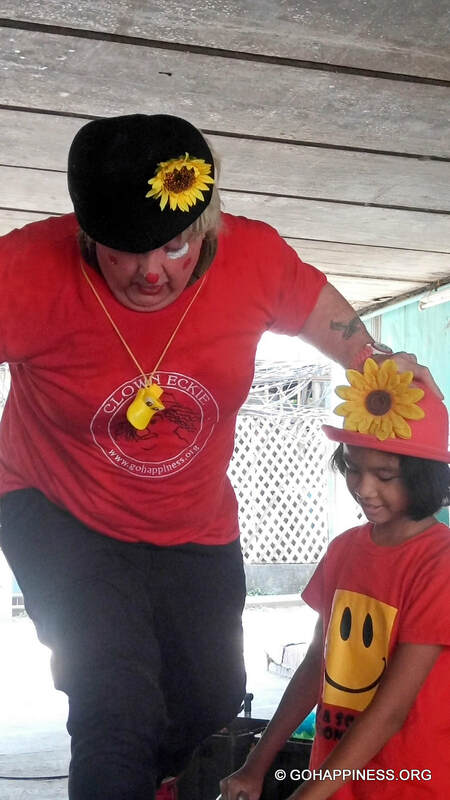 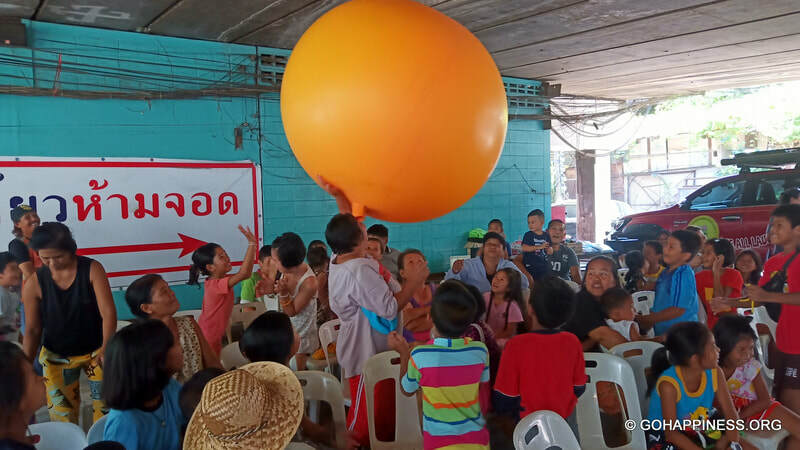 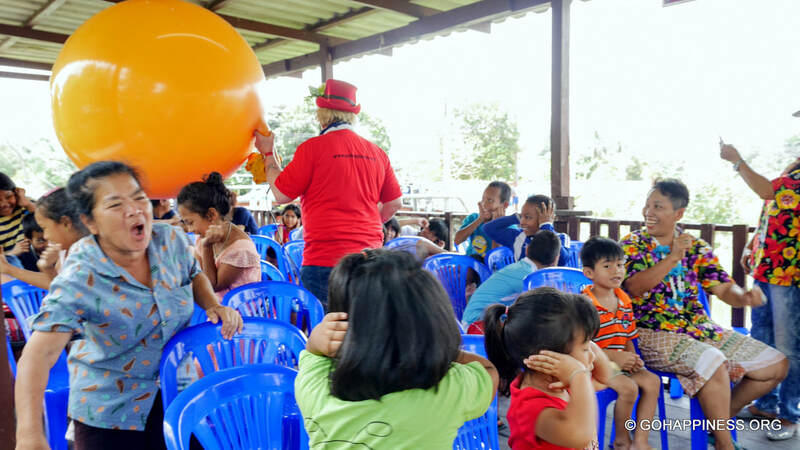 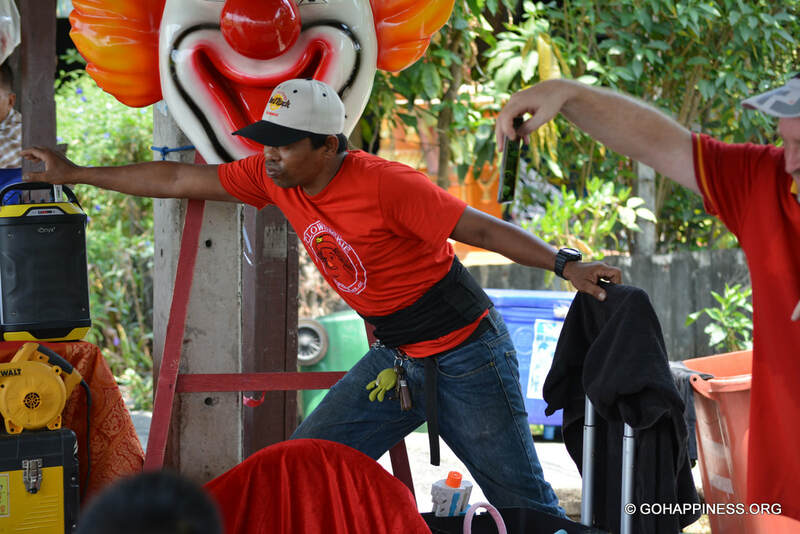 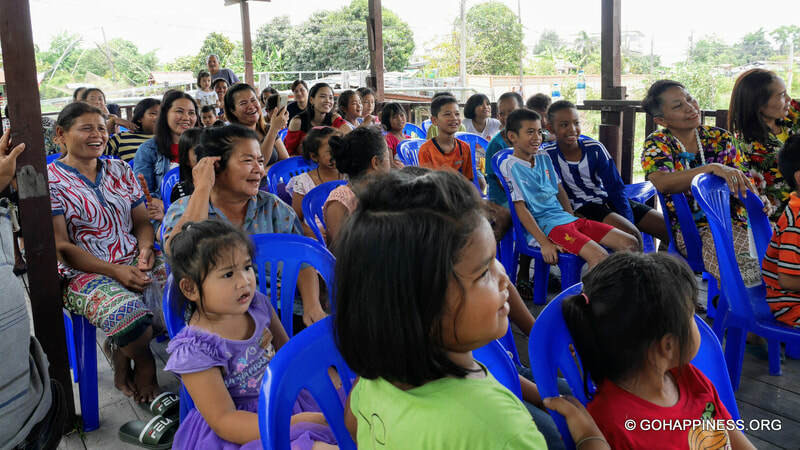 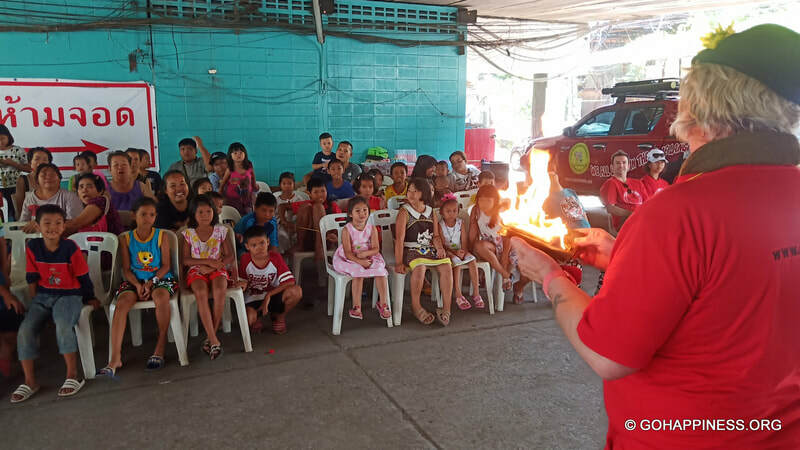 ​In March 2019; Gift of Happiness Foundation promised to give the residents of this small community some more aid and a free performance by the only European Professional Circus Clown in Thailand. 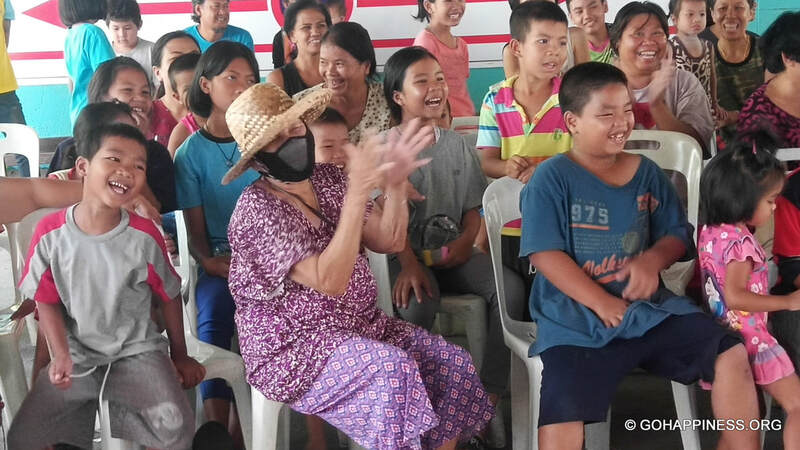 The Charity also made a commitment to support a severely disabled person who lives in the Sutthawat Community with some initial (wheelchair) medical support and ongoing nutrition/medical support if a sponsor can be found. 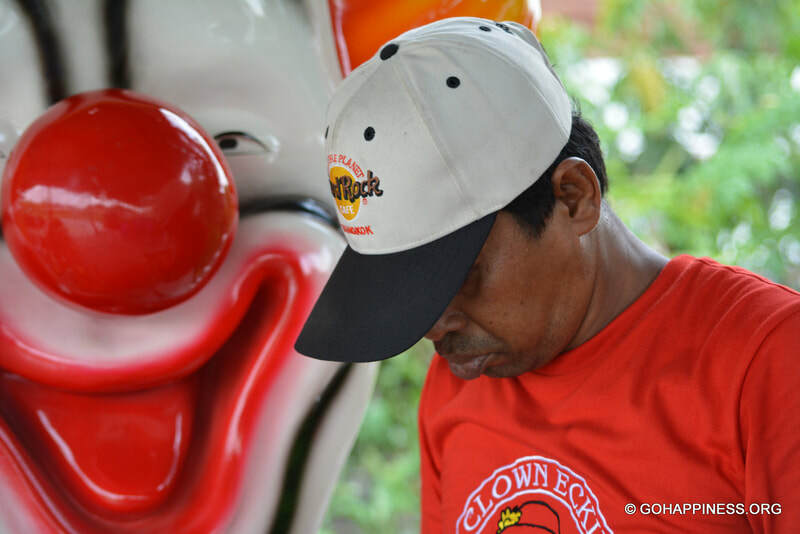 Read on to find out how it's going? 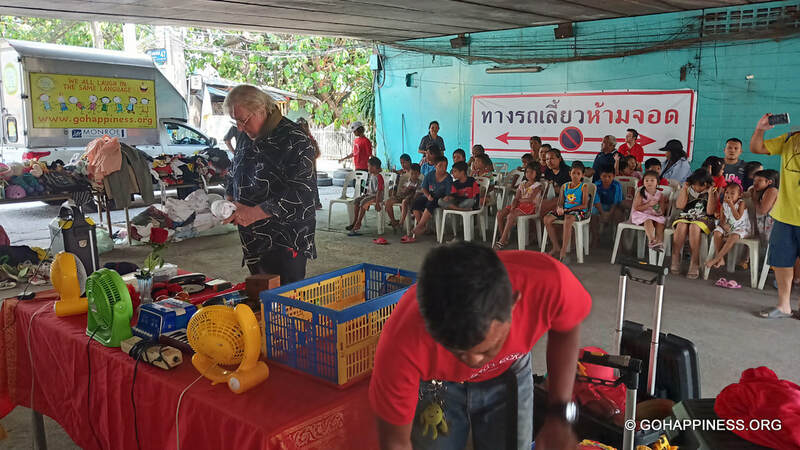 Volunteers attending the Gift of Happiness Foundation Aid and Performance Giving Project at Suttawat Community, March & April 2019; Eddie Haworth, Nicol Burr, Renato Porzio, Tony Doherty, (Thailand expats) plus David and Marinela from UK. 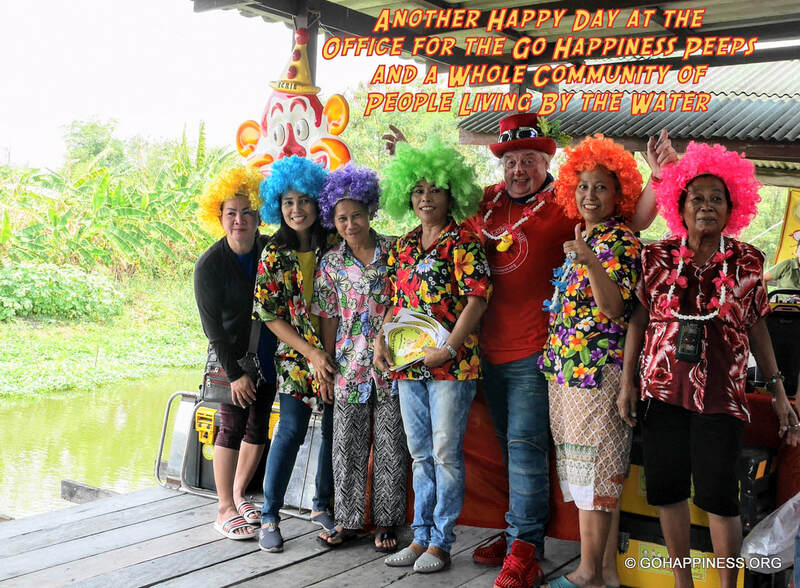 As promised, (Here) the Go Happiness team of trusted Volunteers and Clown Eckie arrived to find children and community leaders seated and waiting diligently on the quite rickety “canal balcony”. ​Once more the community regales us with a wonderful and touching experience. 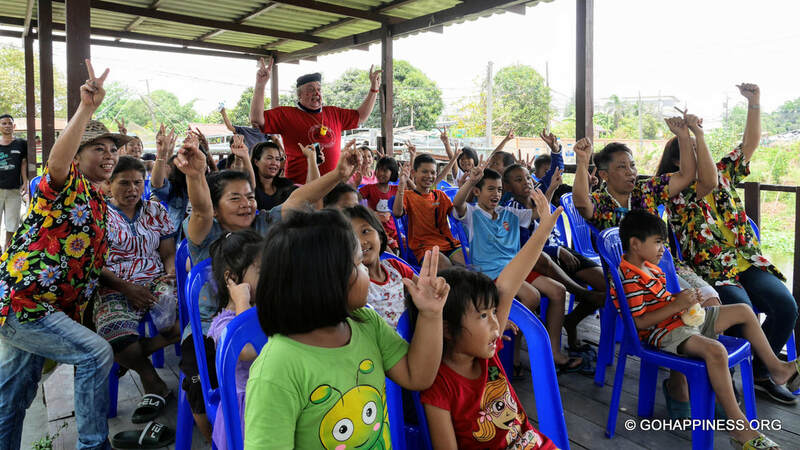 The children of the “Suttawat Community” had been looking forward to this day with enthusiastic expectation. 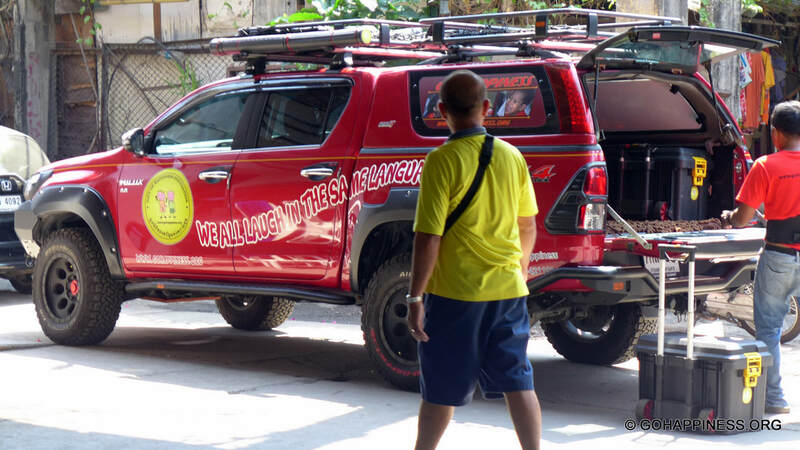 As soon as they see the burgundy car with all the yellow stickers, and the truck, they are running along the small, narrow bridge towards us. 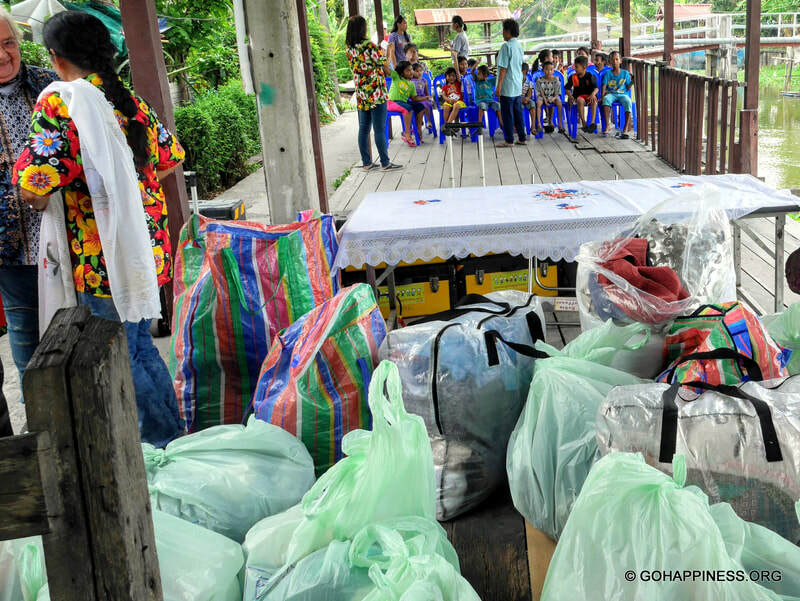 Everyone is ready to help to carry the loads of clothes, towels, bedding, toiletries, toys, educational books. 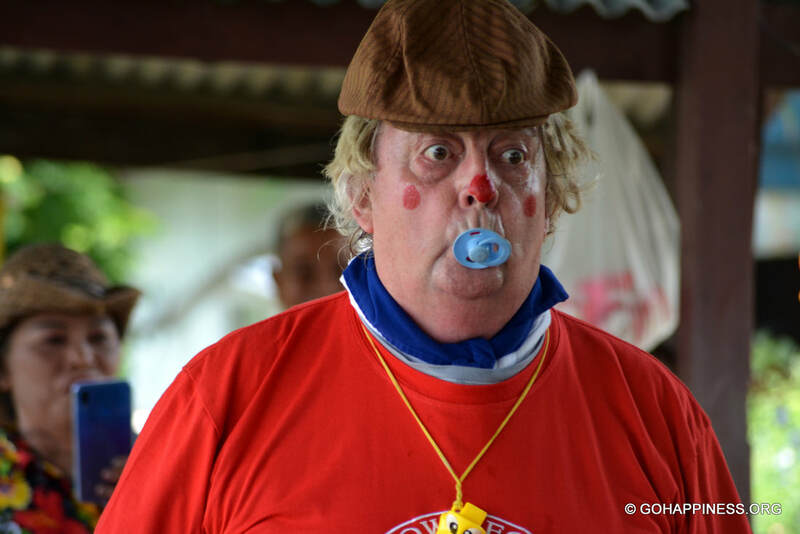 And ... Clown Eckie’s own show accessories. 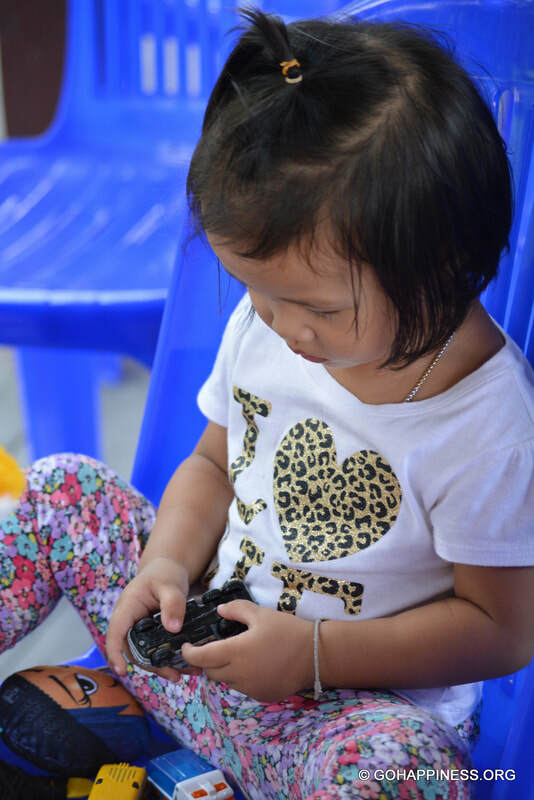 We pay a short visit to “Nong Ham”, who is waiting us together with her mum, cousin, and granny. 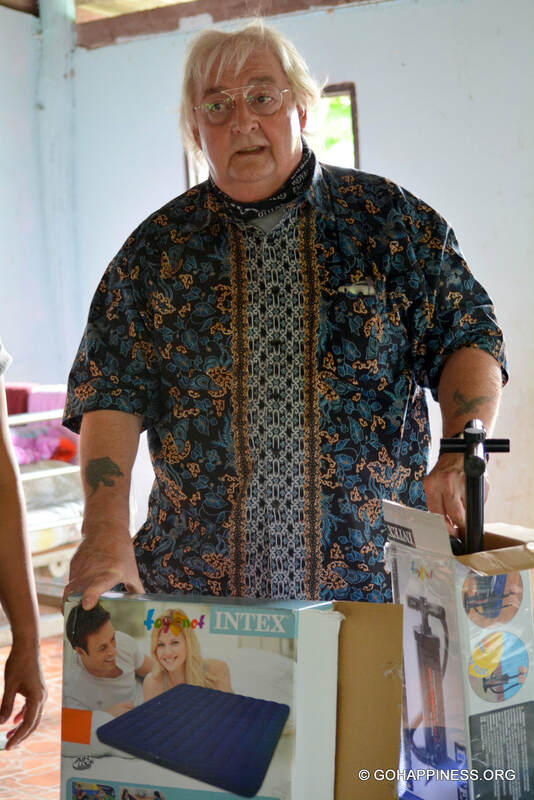 We deliver a high-quality air mattress, which will alleviate the strain of being confined to a sleeping position. 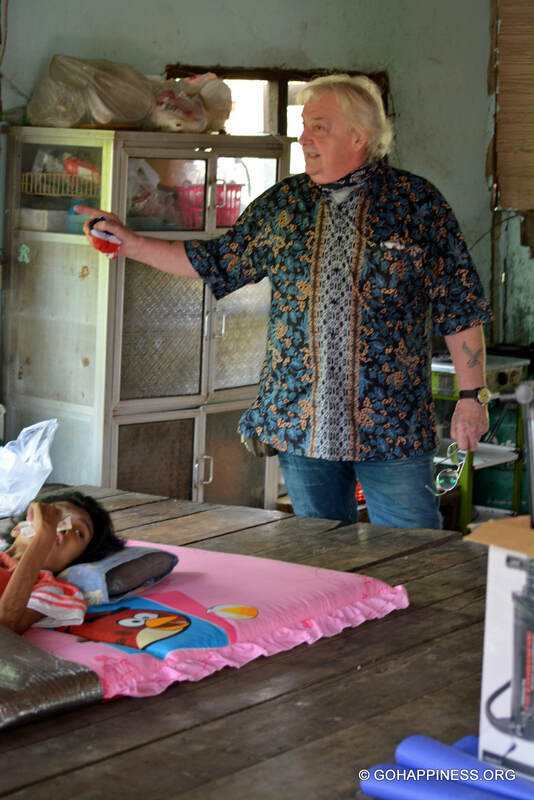 We also confirm that we got in touch with a hospital, and it will be possible to get Nong Ham examined by a specialist. 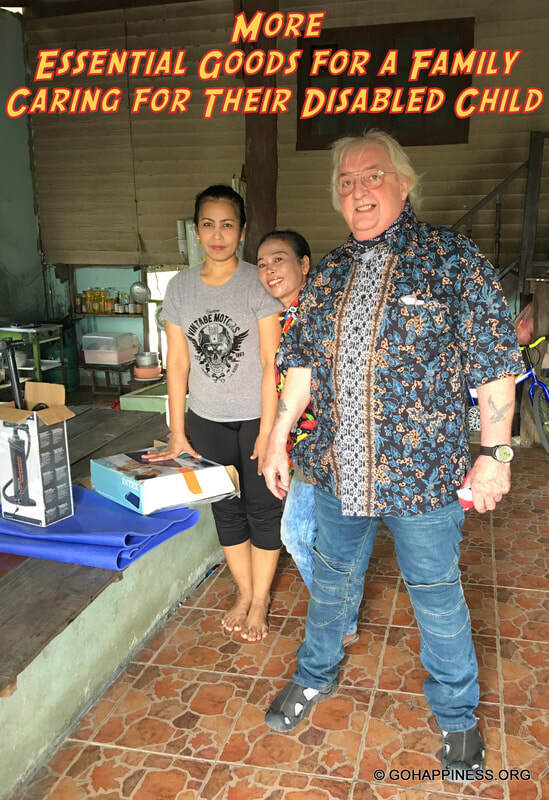 Before we leave, Go Happiness Founder, Eddie Haworth made a commitment to give Nong Ham's artistic Cousin a whole load of top quality artists materials that he's been saving for someone who could go far in the art world if only she had the right kind of tools to work with. 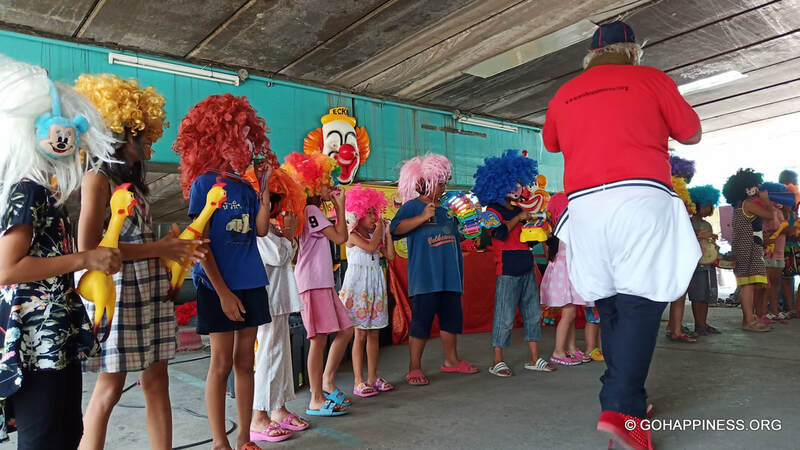 Back we are, on the stage. 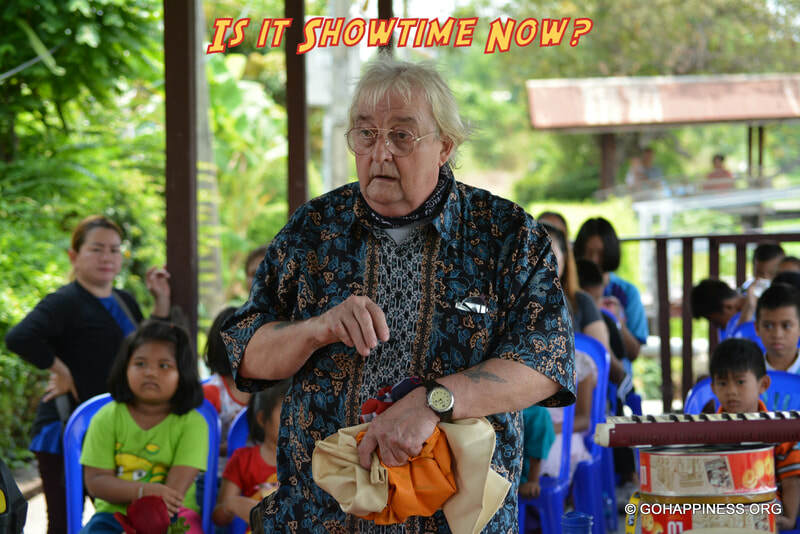 A short wait, and Eckie is ready for the great performance. 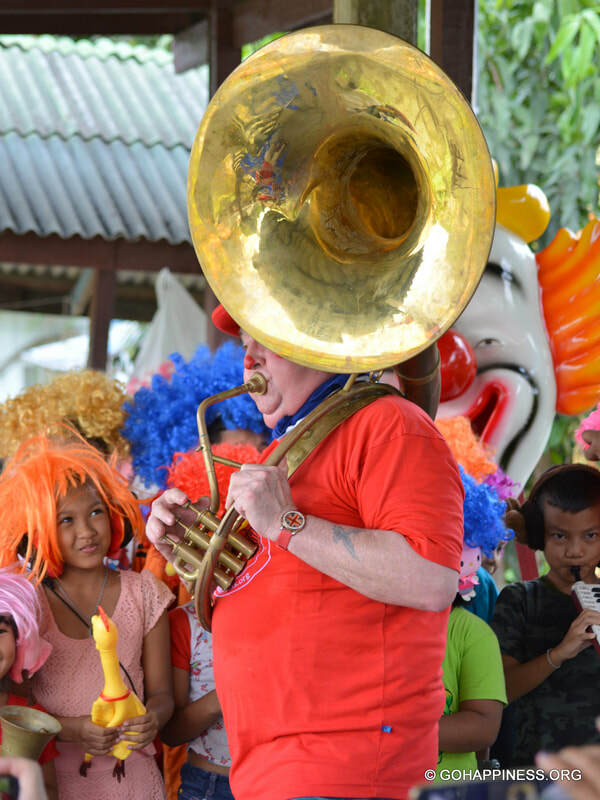 Wigs, musical instruments, whistles, concertina and a majestic sousaphone: all set to engage the children in a whirlwind crescendo of enthusiasm. 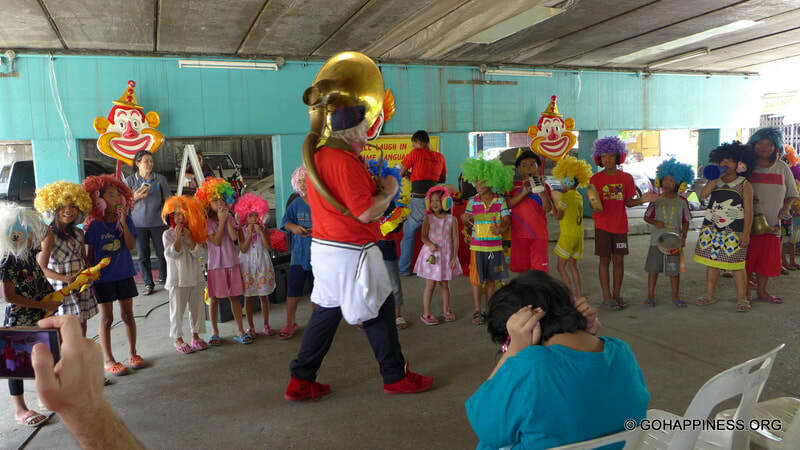 In the background, the elders of the community are enjoying the show not a bit less than the children. 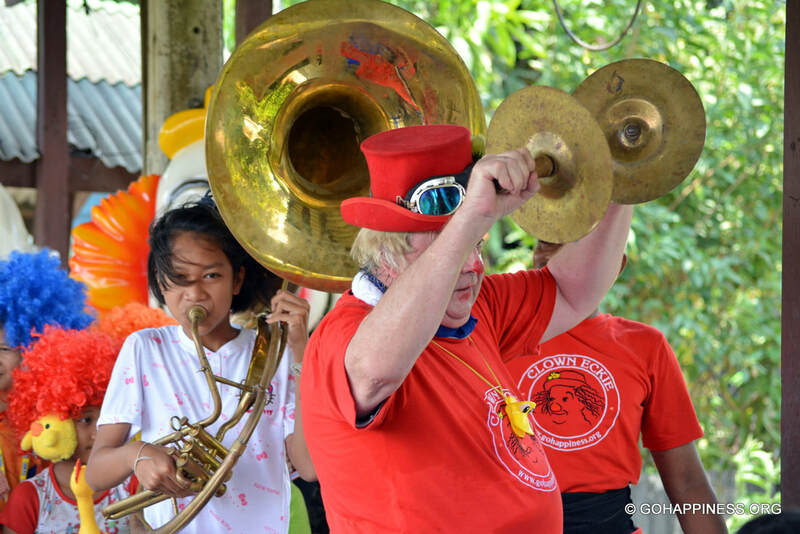 End Report by Renato G Porzio. 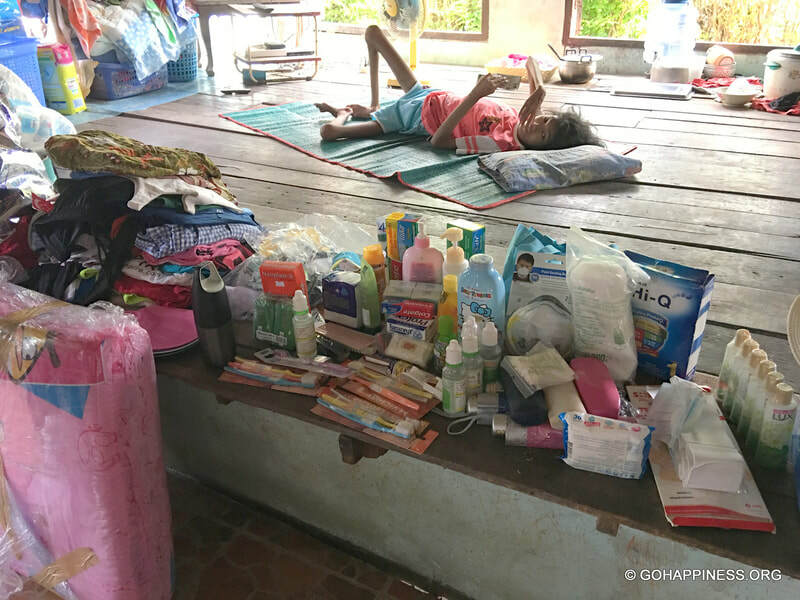 Update 08/04/19; Gift of Happiness Foundation have arranged for an ambulance to take Nong Ham to a Hospital in Bangkok where she will be given a full health check and the examining Doctors will give us a list of what kind of ongoing treatment she needs. She will also be measured-up for a specialist wheelchair so we can appeal for support of both these things once we have a full appraisal of her situation. Gallery; all images from ​Suttawat Community March/April 2019 Project by Gift of Happiness Foundation. 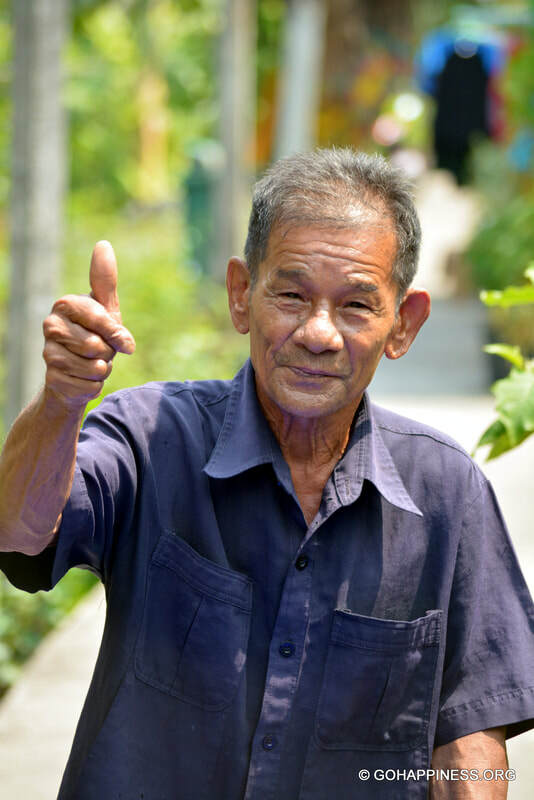 This 62 year old homeless man has no support from his family or any other agencies. 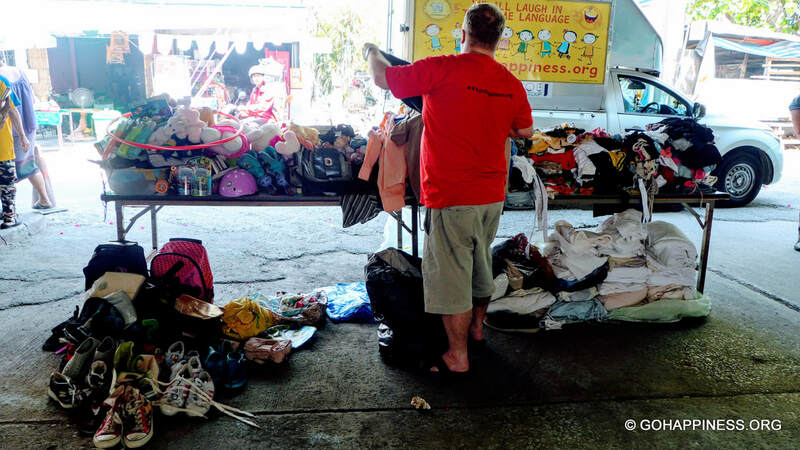 Just like all others helped at the Go Happiness Centre...He is extremely grateful for what he receives! 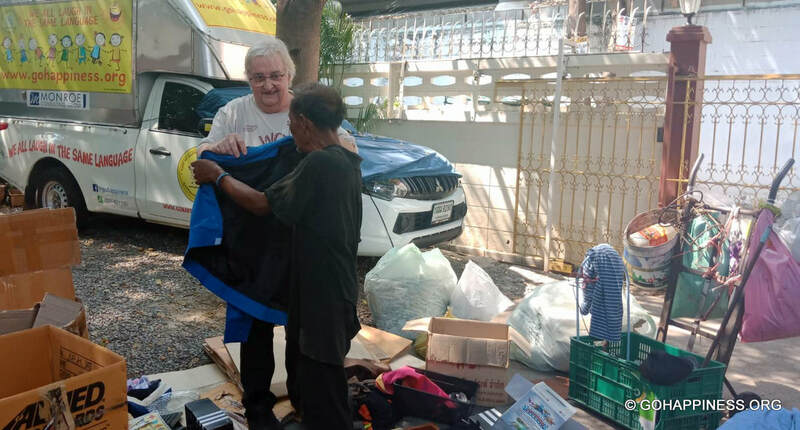 And 66 year old Eddie Haworth is always delighted to hand over the goods to genuinely decent people who may have fallen on hard times! 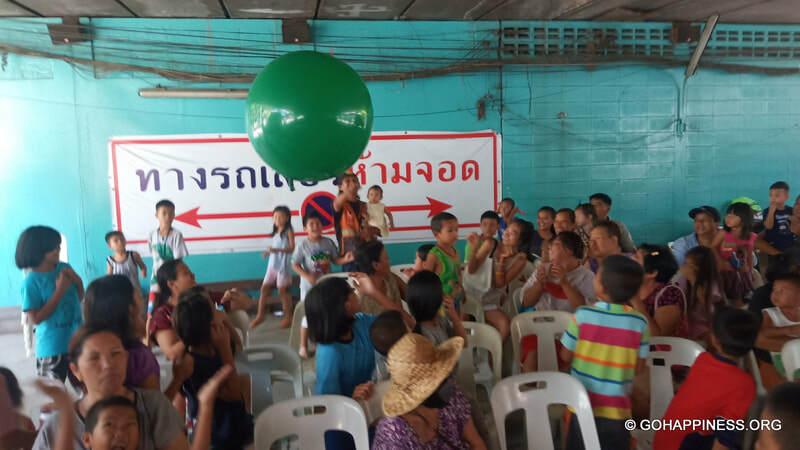 Read about the GoHF regular Aid Giving Projects at the Go Happiness Centre, Bangkok slums and and all over Thailand. 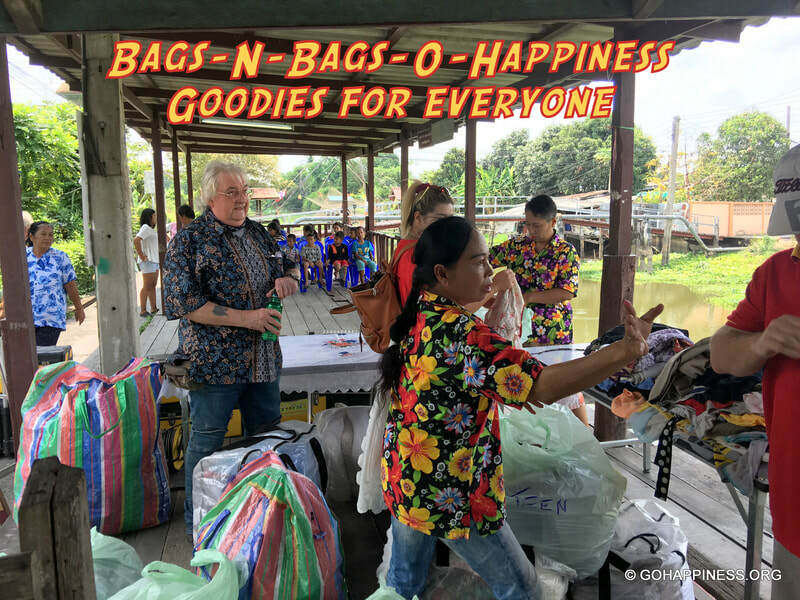 Providing essential aid packages to single mothers, scrap/garbage collectors, street children, homeless people and old age people living without support in Bangkok. 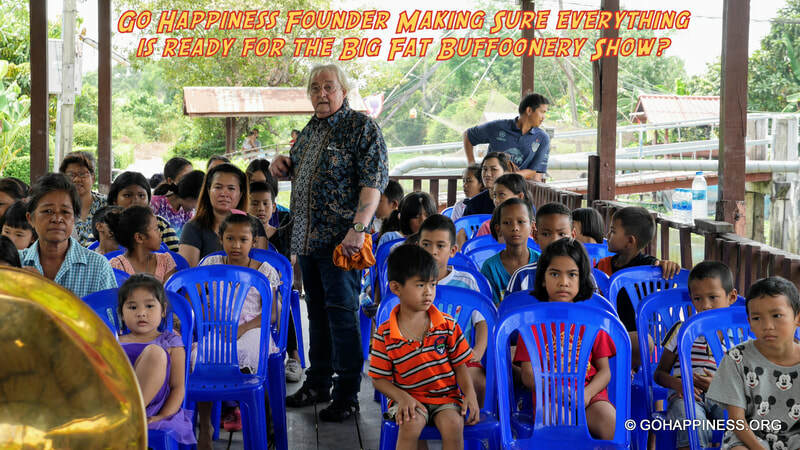 ​on some very needy peoples faces. 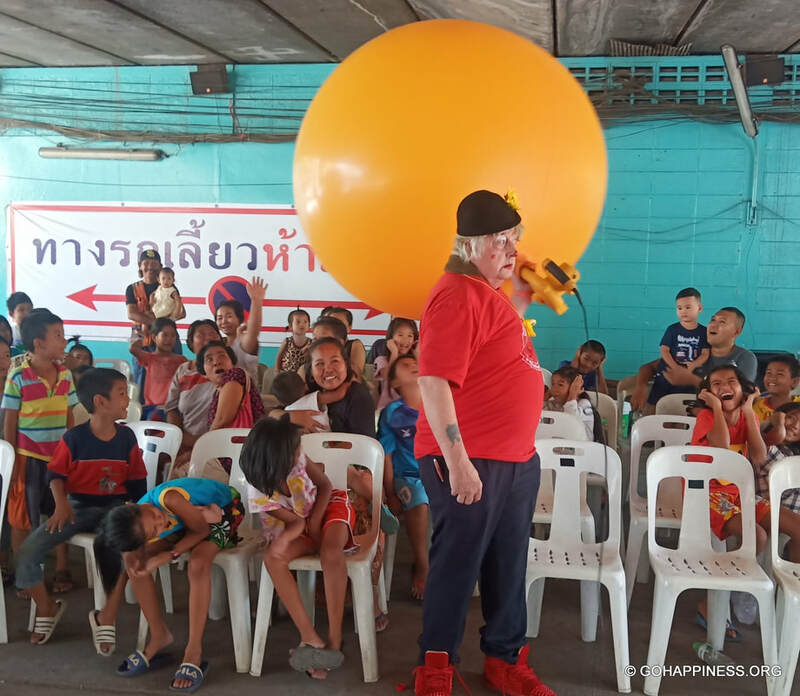 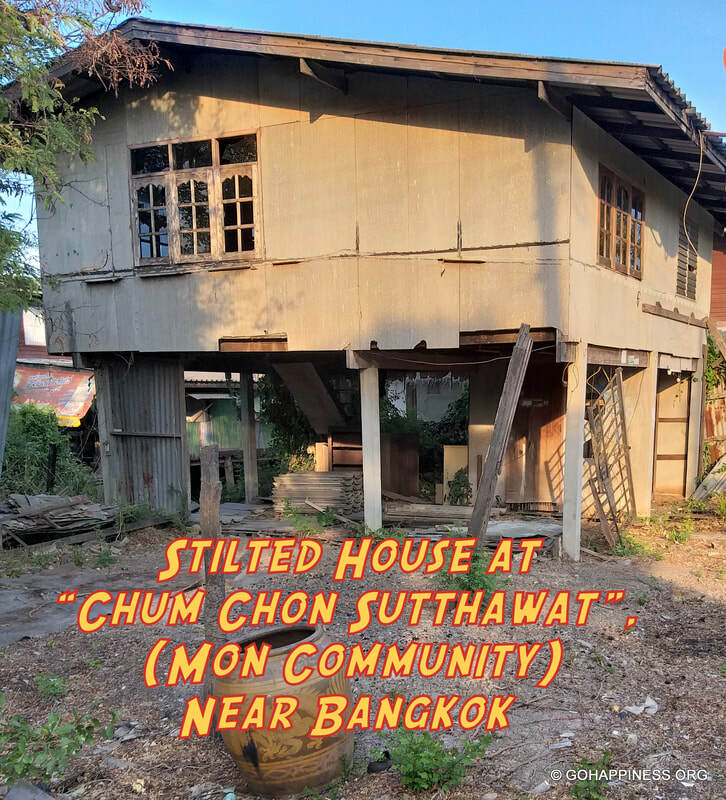 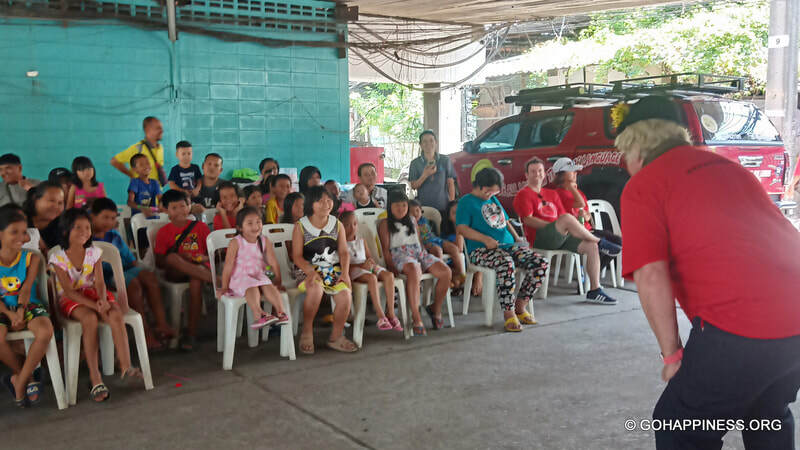 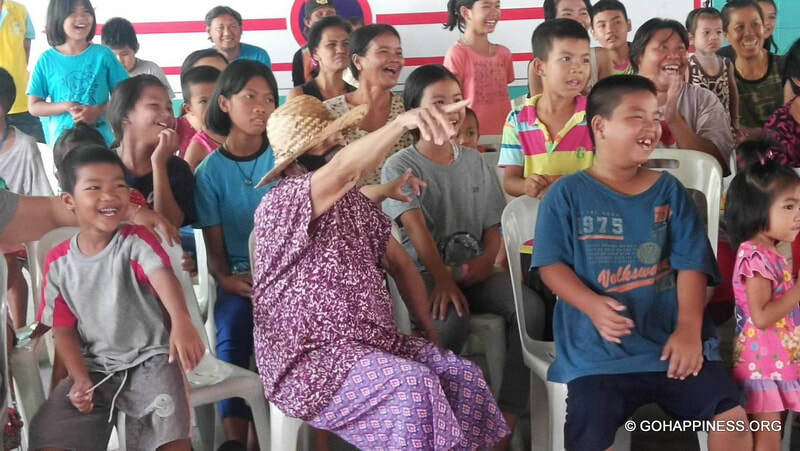 22/03/19; Volunteers with the Gift of Happiness Foundation paid a third visit in as many weeks to the “Chum Chon Sutthawat”, Mon Community located near Suvarnabhumi Airport, Bangkok. 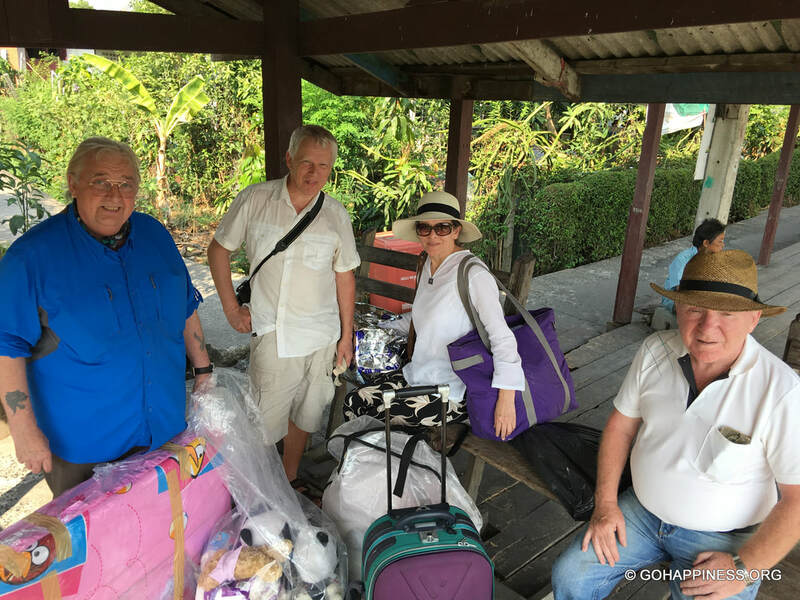 GoHF Founder, Eddie Haworth spent several hours at the Go Happiness Centre, sorting through some much needed essential supplies. 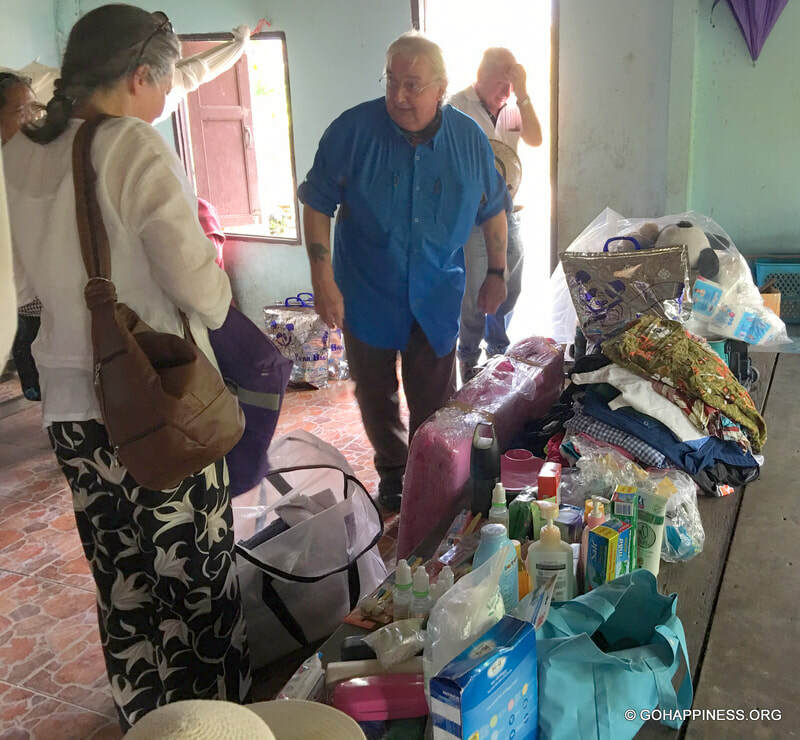 Then, mid-afternoon he rounded-up four more volunteers who would join him to help carry all the goods to the ramshackle home of a severely disabled girl and her handicapped grandmother who live under harsh conditions in the Village. 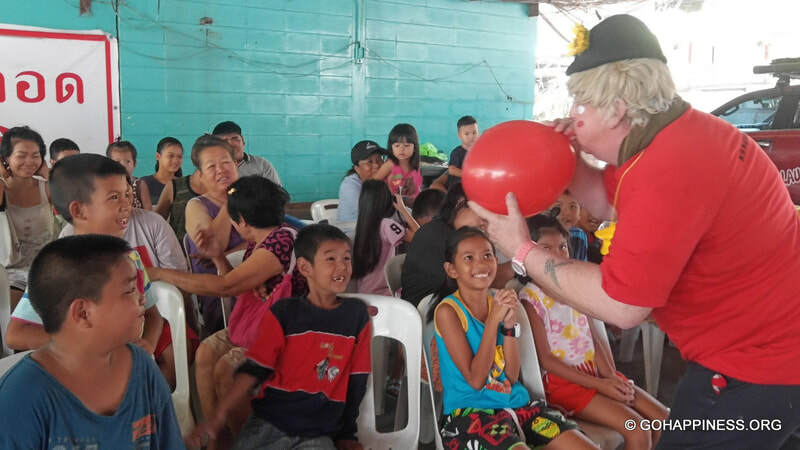 "Big Fat Buffoonery Show" by Clown Eckie! 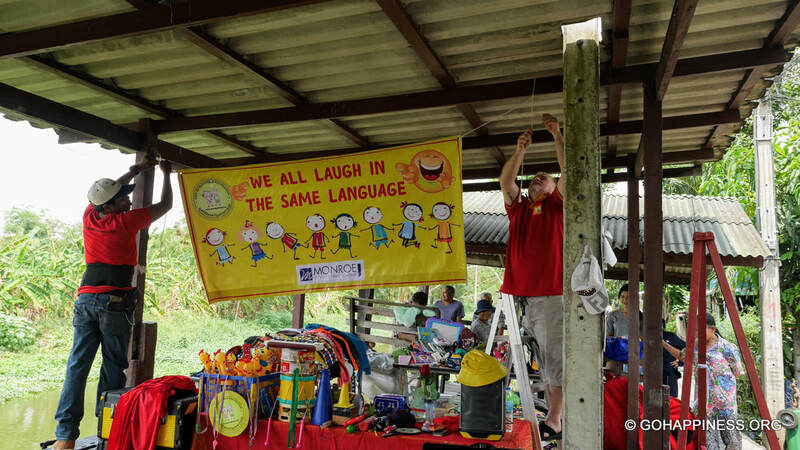 Volunteers; Eddie Haworth, Renato Porzio, Tony Doherty, David and Marinela from UK. 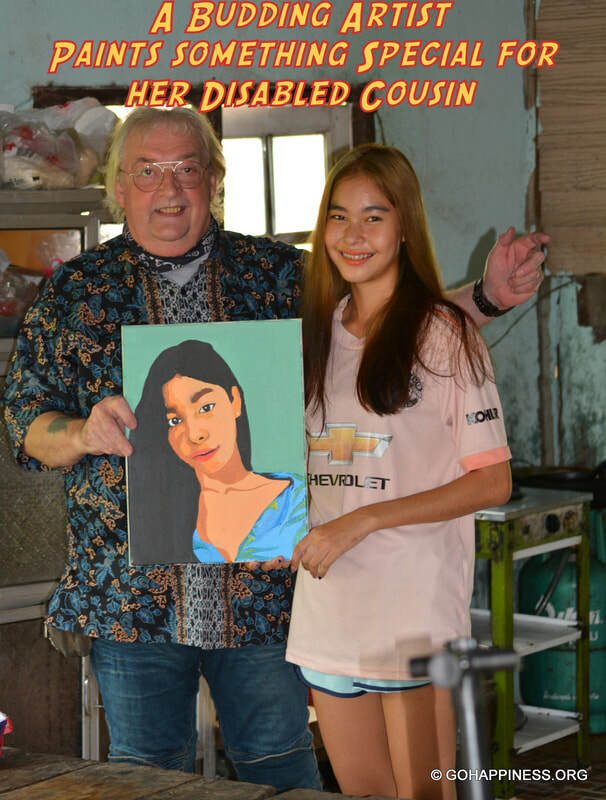 "We need to buy a wheelchair for this girl"
Crossing the huge campus of the “King Mongkut, (Rama IV), Institute of Technology” is an experience, but getting to the “Chum Chon Sutthawat”, (Mon Community), is even more impressive. 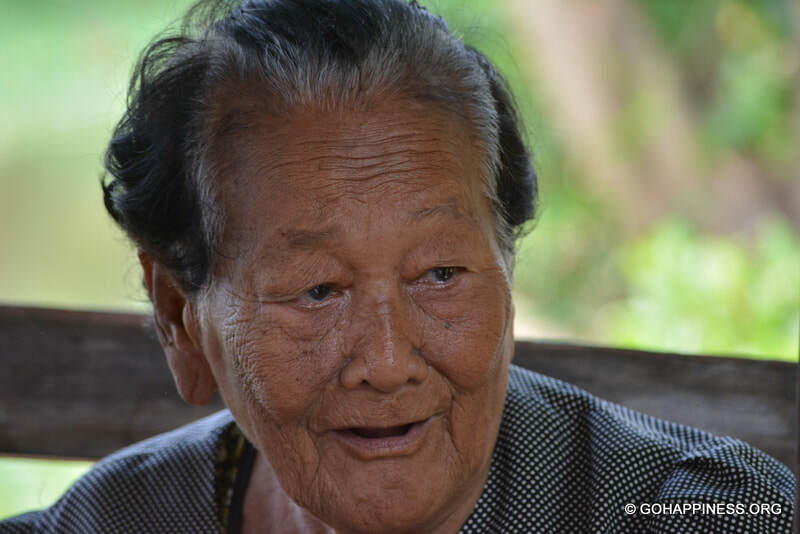 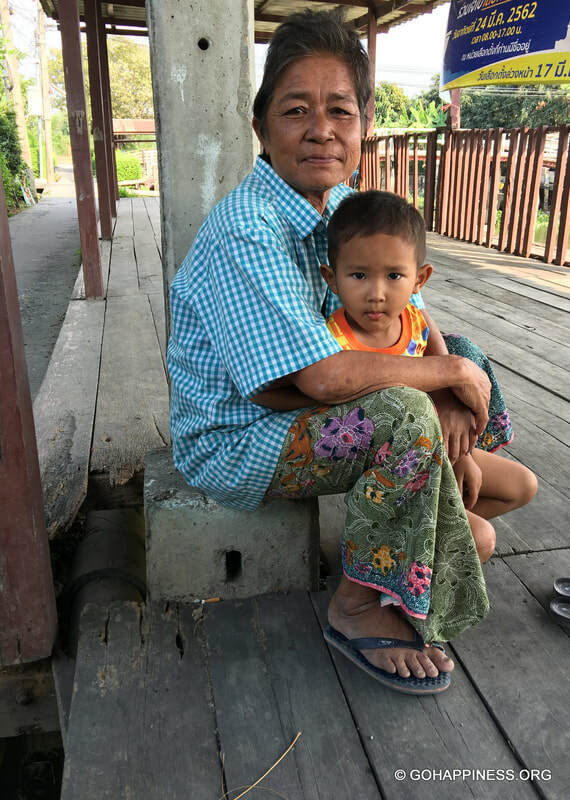 The little village, built on stilts, lies along the Liam canal, and as soon as we cross the bridge, Auntie Tu welcomes us with her usual charming and sweet smile. 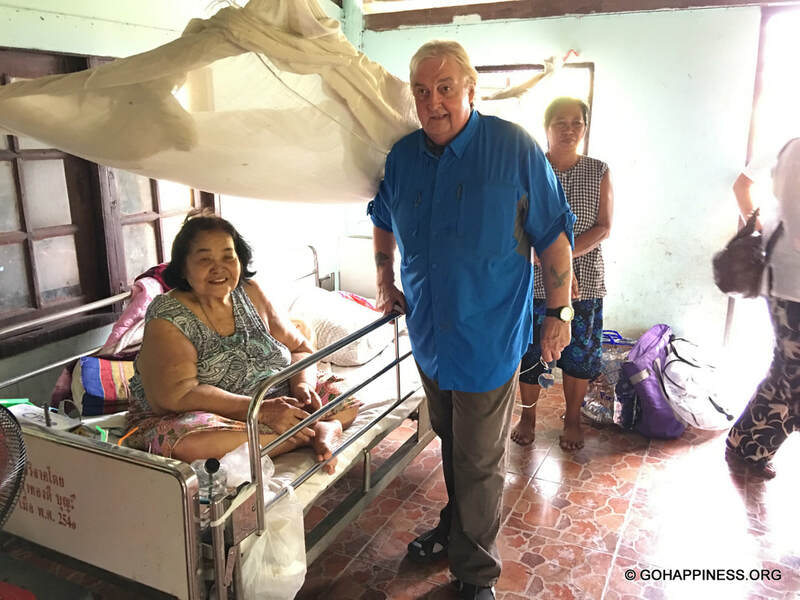 Here we are, the GoHF, lead by the Founder, Eddie, and three friends from England ; Tony a long time resident, and Marinela and David who are visiting Thailand for the first time. 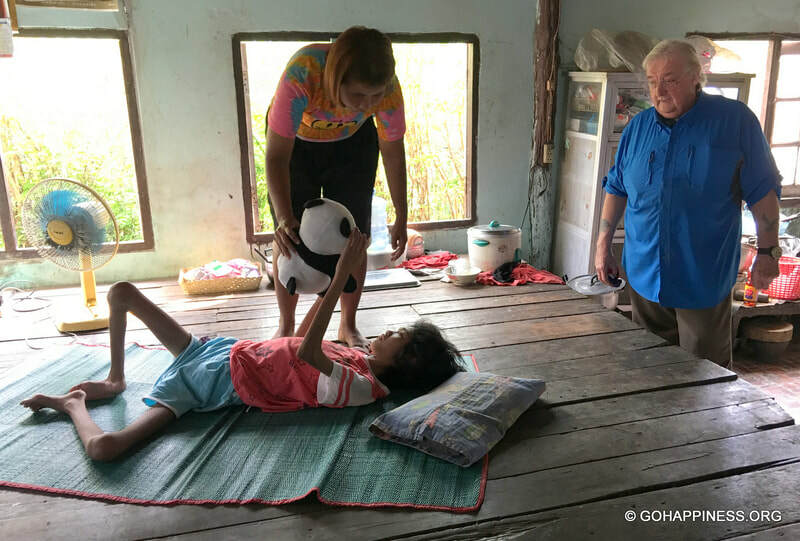 Five of us carrying eight heavy bags full of “goodies” for “Nong, (Little), Ham”, a 16 year old girl, very sadly confined to a sleeping position, due to her disabilities. 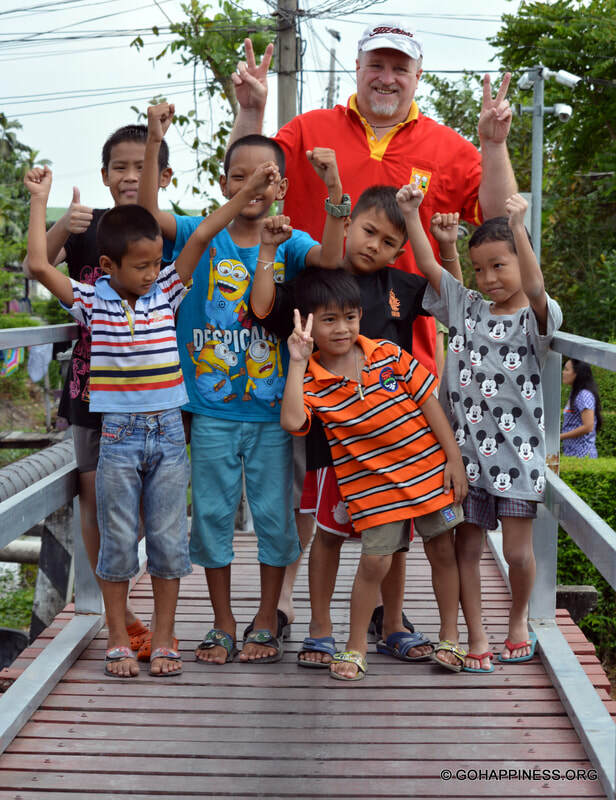 Some members of the Community with their children joined us, and lead the way to “Nong Ham” house. 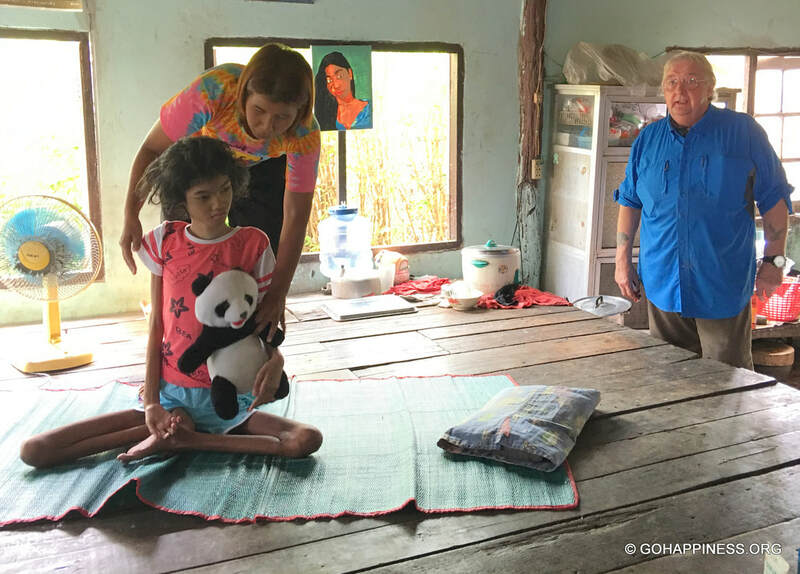 “Nong Ham” is assisted by her mother’ s cousin, and other friends, as she needs 24 hours care. Her Grandmother is confined to a sitting position on a bed, due to physical inability to stand and walk. 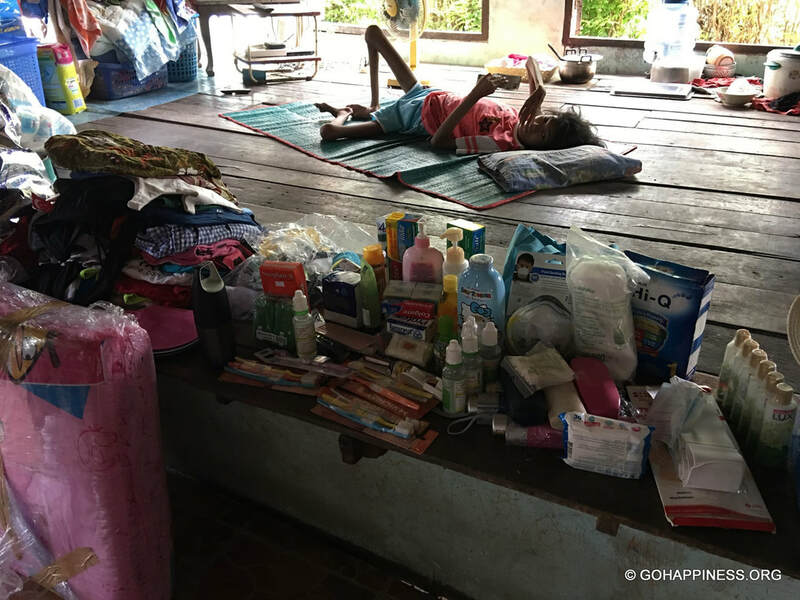 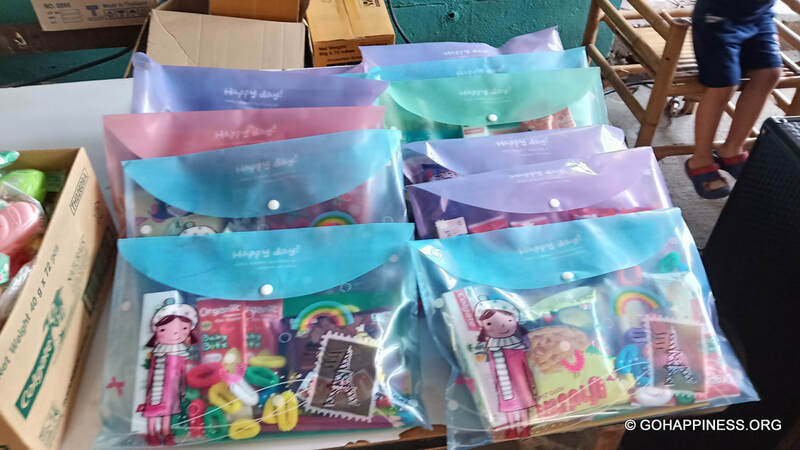 We delivered five dozen milk cartons, toothpaste and brushes, clothes, towels, a soft mattress where Little Ham can be accommodated in a more comfortable posture, high protein food, sanitary products, and soft toys. 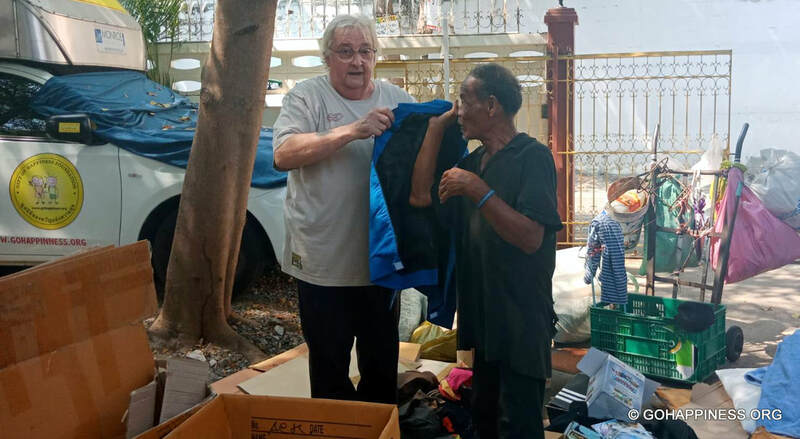 It is always great to experience the very strong sense of community which bonds them together; the way they help each other and assist those in need sends a strong message to all of us, living in this so materialistic a world. 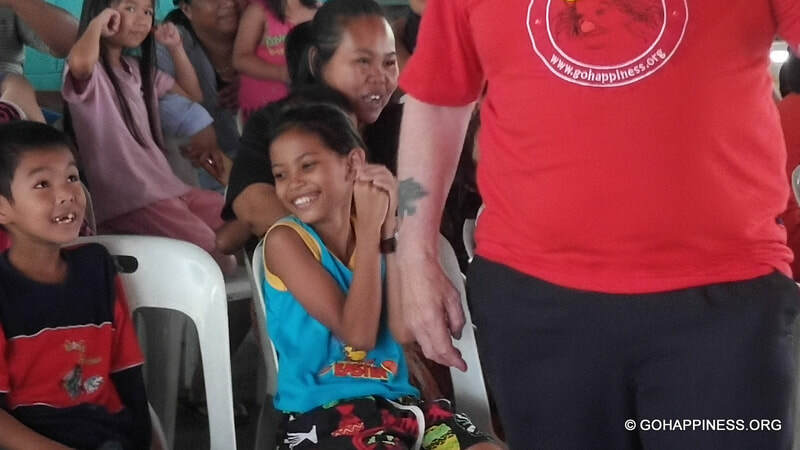 The smiles of the children, the Family, and those from the community who have accompanied us, are the great reward. 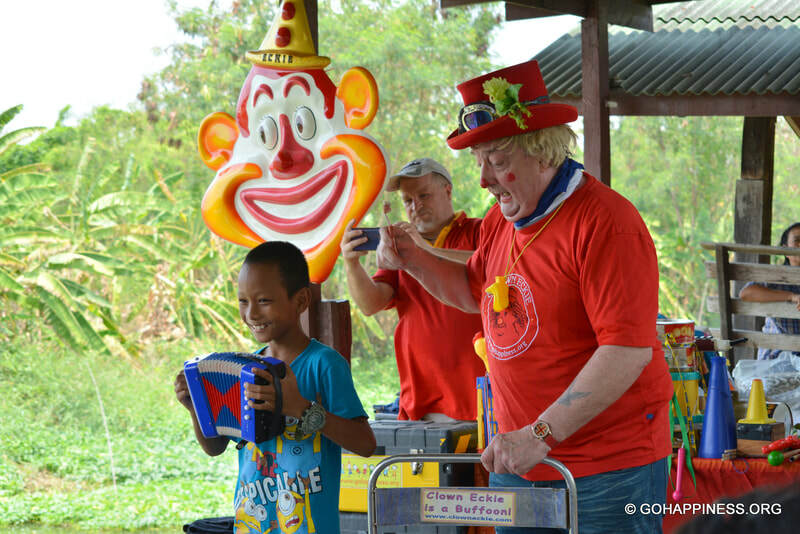 We will go back again on April 07th, to deliver a lot more “goodies”, and a special performance for the whole community, given by “Clown Eckie”. 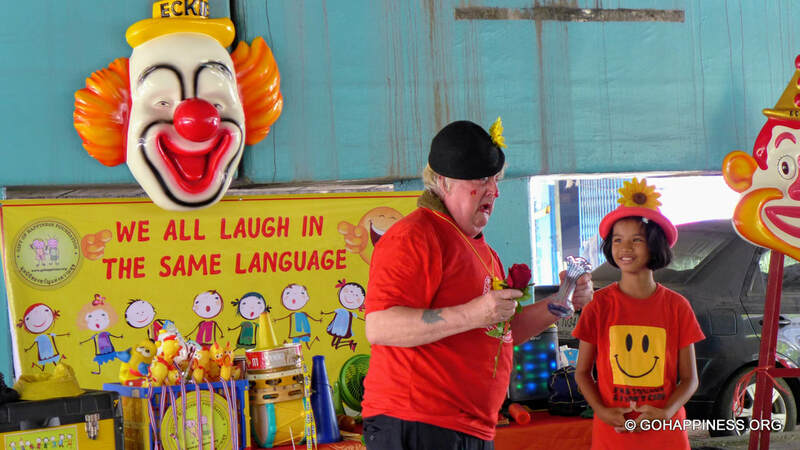 Well done, Eddie. 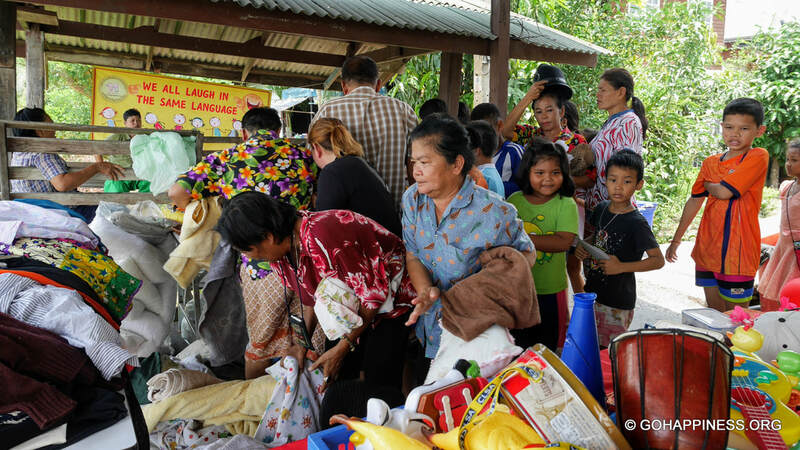 Once more the GoHF has brought badly needed help to the Sutthawat Community, plus many sincere and warm smiles were placed on some very needy peoples faces. 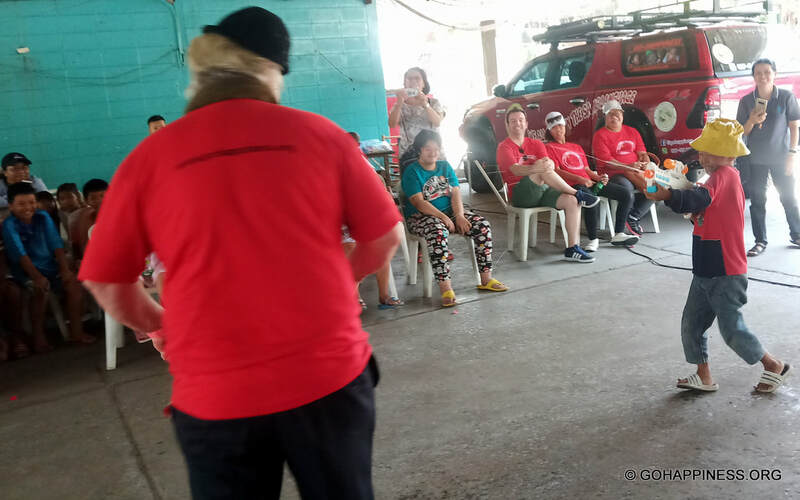 End report by Renato Porzio.